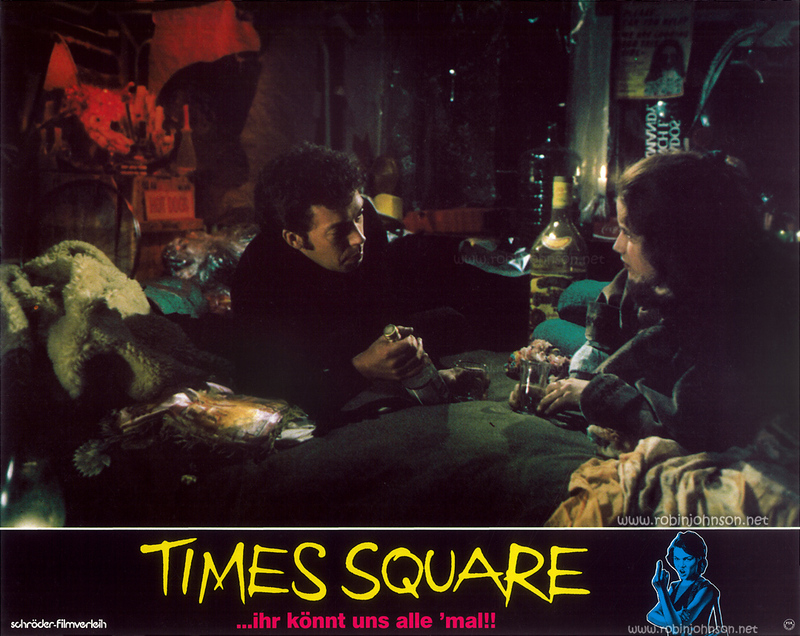 Posted on 28th March 2019 in "Times Square"
Three more German lobby cards. 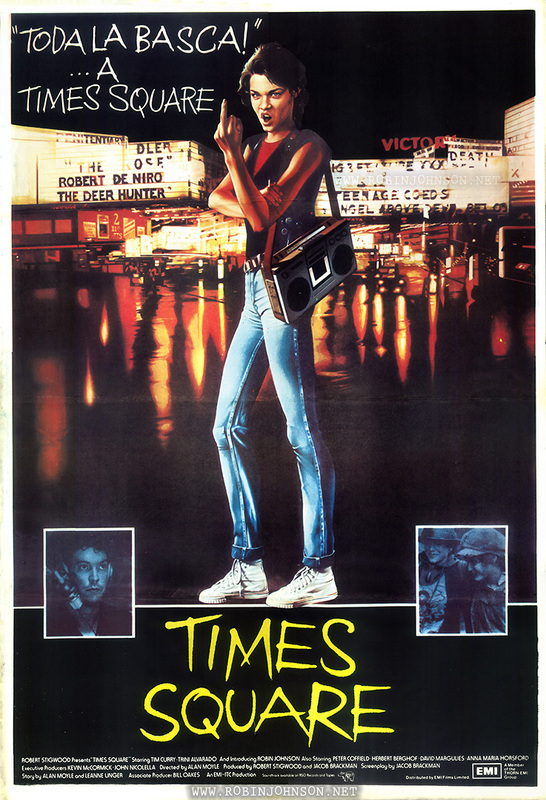 The shot of Johnny at the mic was previously a British lobby card, and had been published in Movie 81 No. 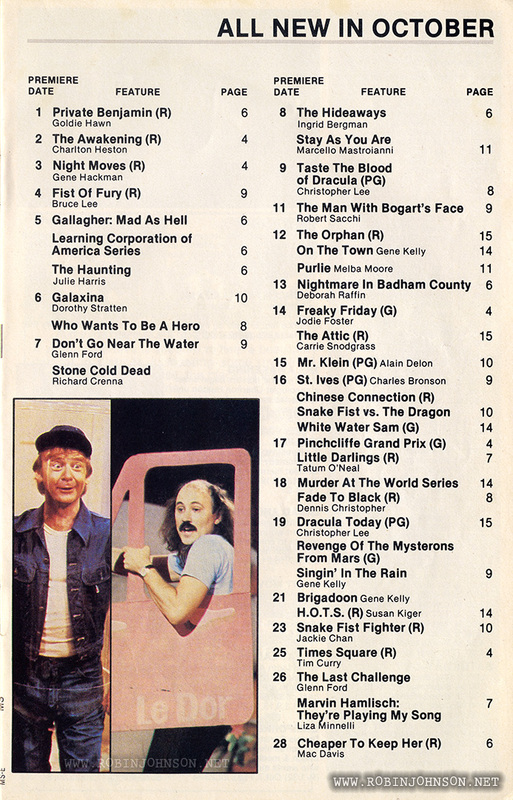 2 in February 1981. 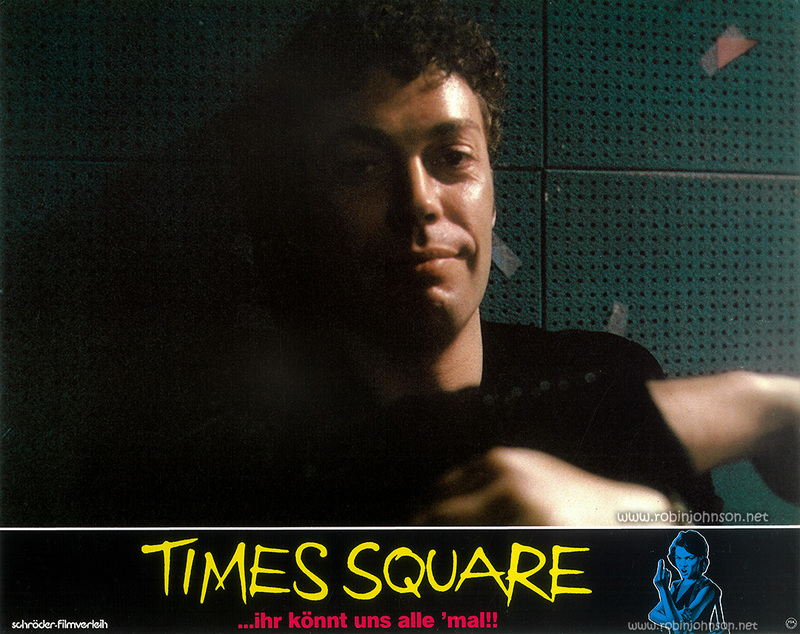 It would appear to have been taken at the same time as the shot that appeared in the center of the gatefold of the soundtrack album (except in the UK), and the earliest published photo of Tim Curry from Times Square (in The Aquarian, April 23, 1980), which was also #4 of the seemingly unending series of UK black and white publicity stills. It’s also the card that was missing from the second set of these cards I found, replaced by a card not in the first set. 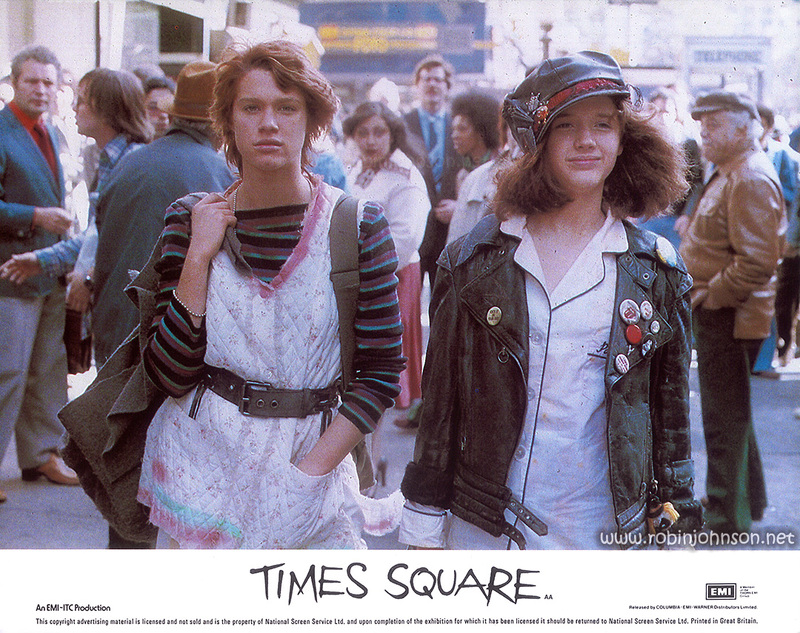 This shot of the girls walking west along 42nd Street towards Times Square, with 6th Avenue behind them, was used in 1981 as a British lobby card. It also appeared in Belgium’s Joepie No. 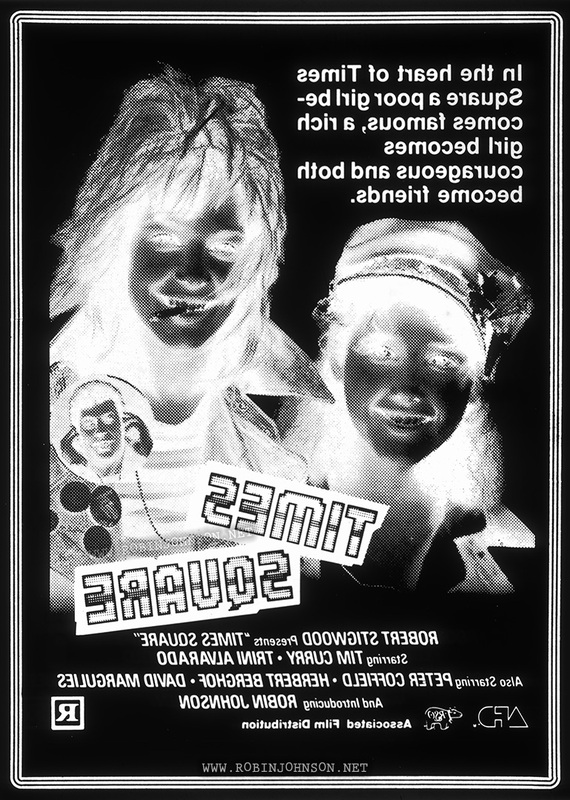 365, on the Japanese movie poster (Pammy’s face only), and in the first promotional piece sent out by RSO. 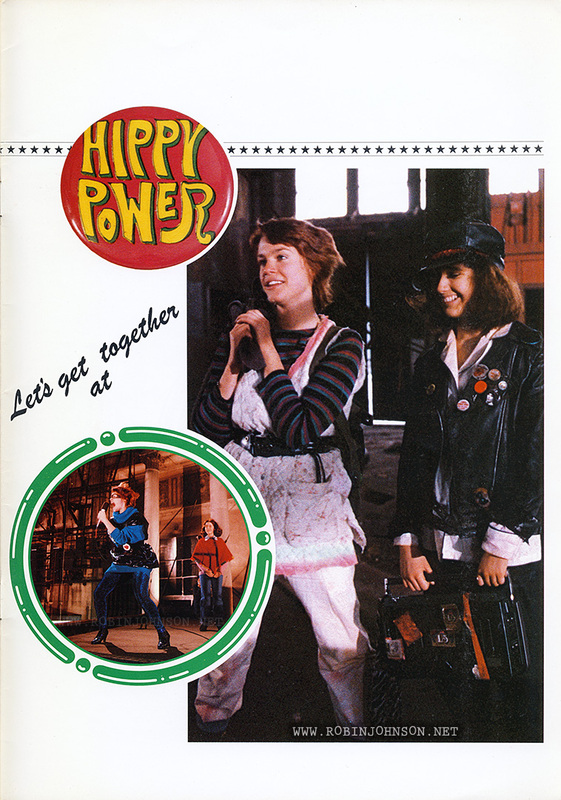 And a cropped version of this photo of Nicky and Pammy entering the Pier 56 hideout previously appeared in the Japanese souvenir program book. 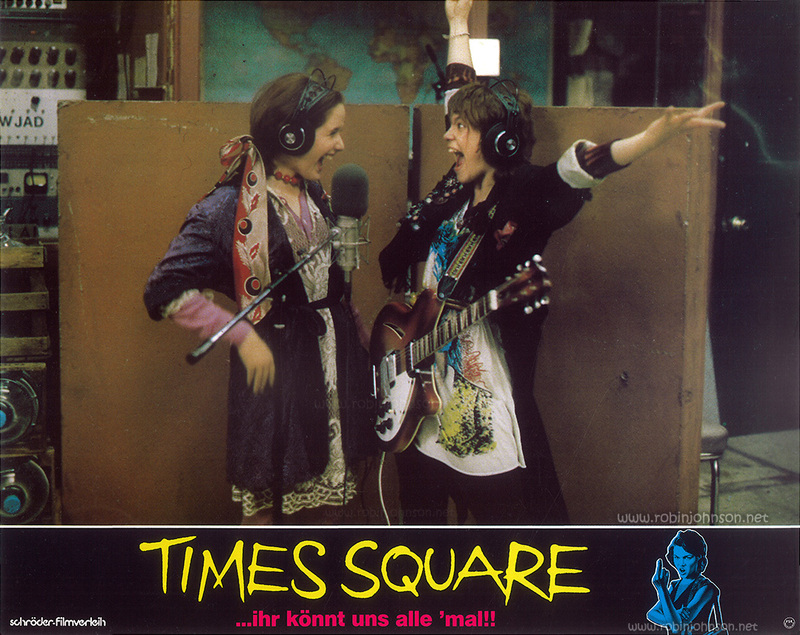 Posted on 15th March 2019 in "Times Square"
Germany may have gotten Times Square last, but they got a set of 15 lobby cards to promote it with. At least, 15 that I’ve found, over several years, in two batches of 14 that each had one different card in them. While 15 sounds like a nice round number, I wouldn’t be surprised if more turn up sometime. They’re not actually numbered, so I’ve put them in an order that makes sense to me. 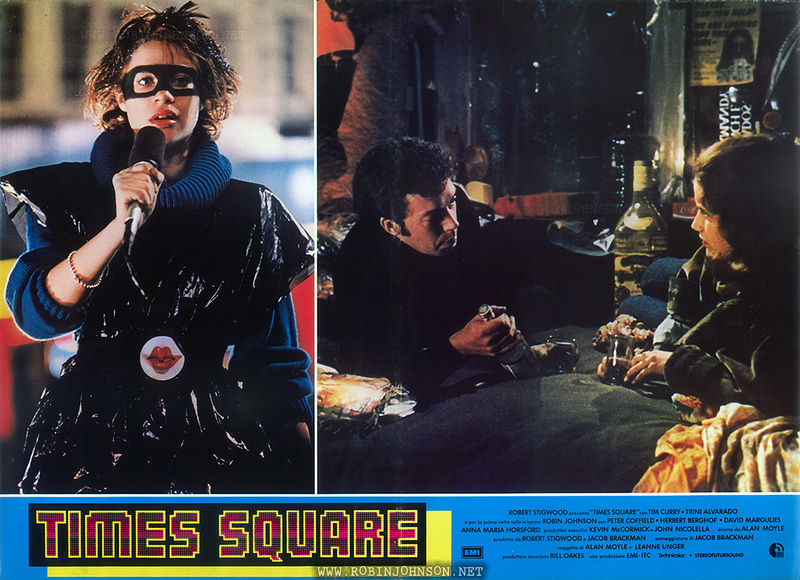 These three distinguish themselves by all being a rarity in Times Square publicity: a photo of the actor, on set and in costume, looking directly into the camera. 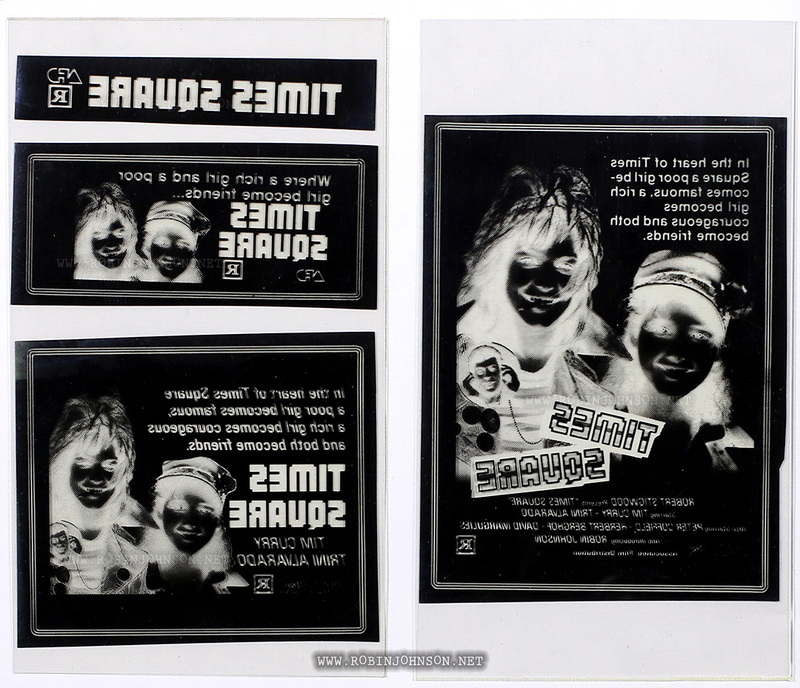 The first is familiar, the photo by Yoram Kahana that was taken at the same time as the shot which became the image on the soundtrack album cover and the North American movie poster, and which was at some point distributed as a slide (one of which is owned by DefeatedandGifted), and printed in Movie 81 No 2, as an inset on the Japanese movie poster, and in Filmstar Vol. 1 No. 6. 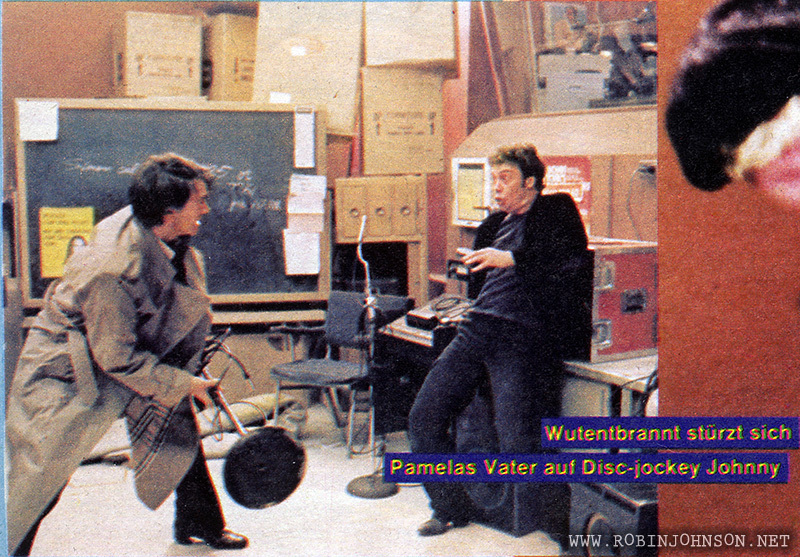 The shot of Trini made its only previous appearance, as far as I know, on a British lobby card. 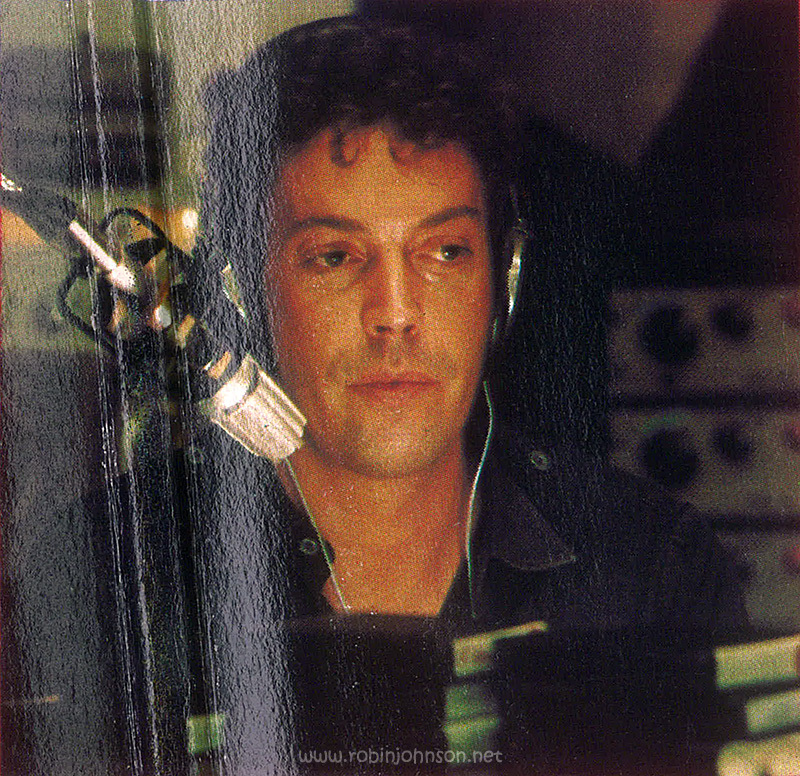 But this shot of Tim Curry as Johnny, lounging in the WJAD control room, only ever appeared on this card. 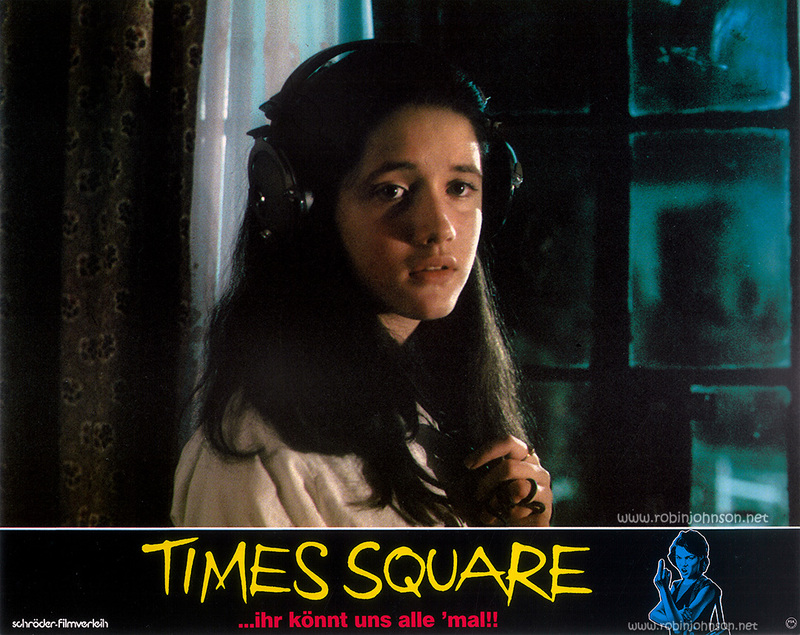 Posted on 2nd March 2019 in "Times Square"
Times Square opened in West Germany on May 21, 1982. 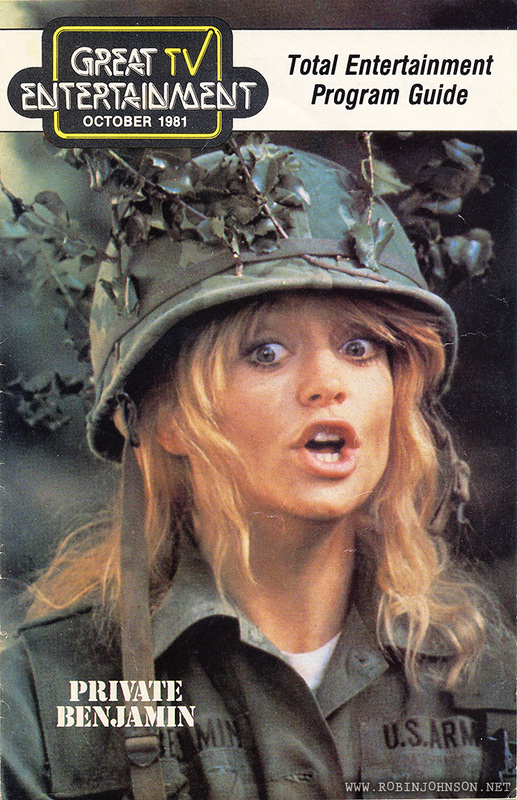 The poster reproduced the painting by Cummins that had graced the other European posters, although with a different pair of photos than the British, Spanish, and Yugoslavian posters, and the addition of a paragraph of ad copy that seems to take its cue from the Belgian poster. auf der wildesten Meile von New York! …ihr könnt uns alle ’mal!! on the wildest mile of New York! … you can all [kiss our asses]! 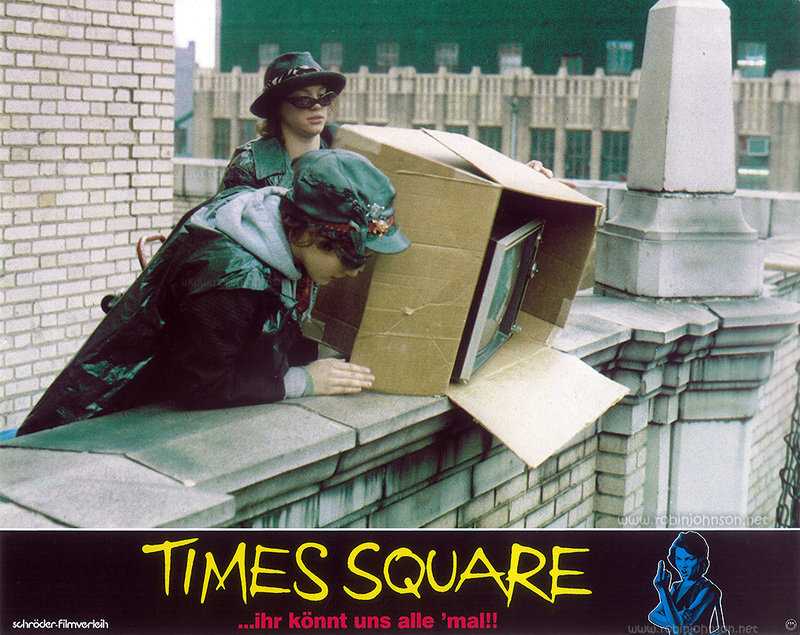 Times Square …ihr könnt uns alle ’mal!! 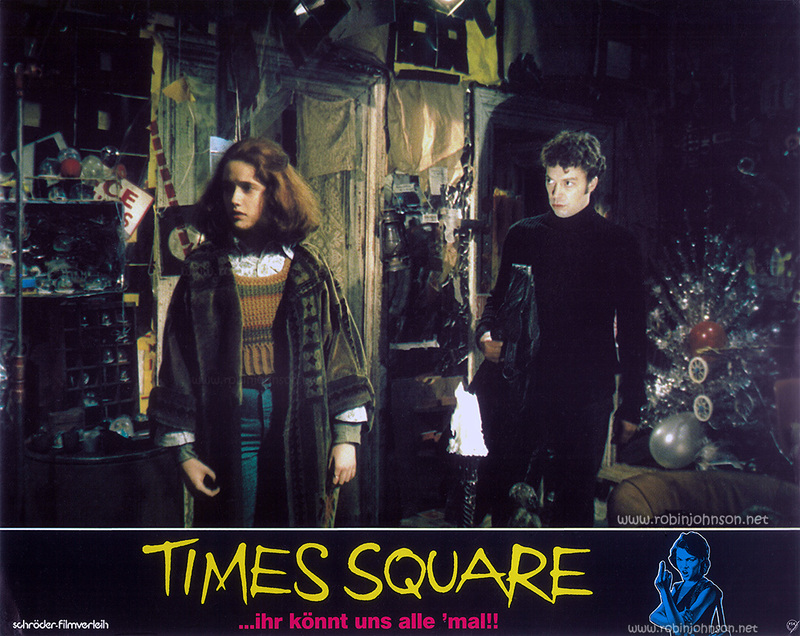 Posted on 17th February 2019 in "Times Square"
My apologies to those scandalized by the cover of Germany’s Cinema magazine from June 1982. It might get one banned from Facebook and Tumblr, but the Germans were apparently not so easily embarrassed thirty-six years ago as we are now. 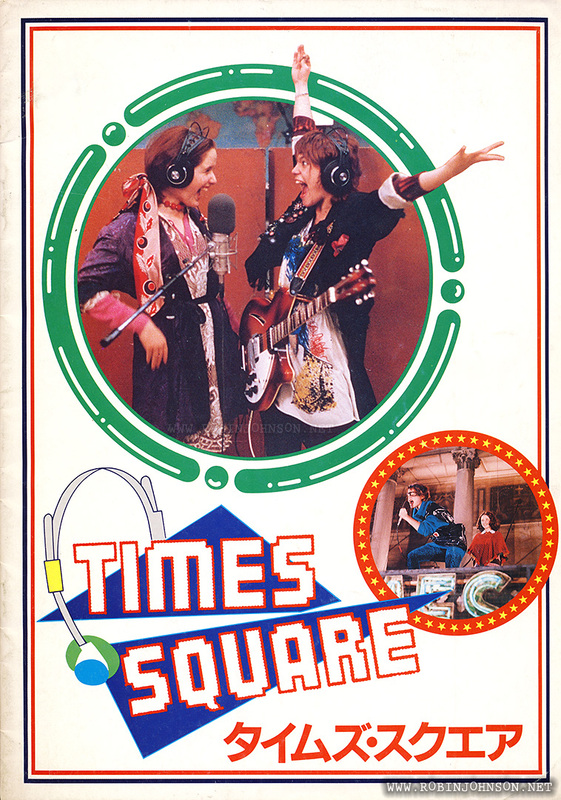 But whatever you may think of the cover, the important thing about this issue is that within are some of the last announcements of an upcoming premiere of Times Square. Page 8 leads off with a capsule review and a one-dot (“above average”) rating. cinema verleiht Filmen, die nach Meinung der Redaktion qualitativ über dem Durchschnitt liegen, ein Prädikat – kenntlich gemacht durch einen oder mehrere Punkte. Cinema awards movies that, in the opinion of the editors, are qualitatively above average, a rating – indicated by one or more points. 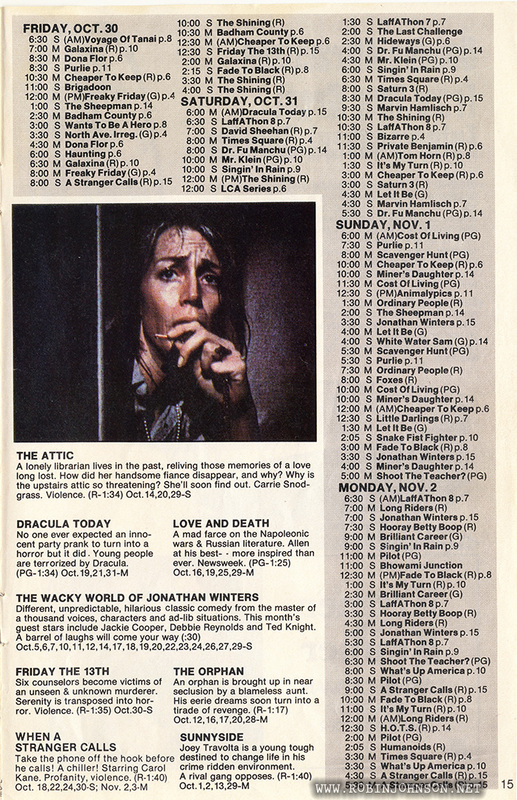 The two-page spread on pages 66 and 67 contains the by-now familiar not-quite-accurate synopsis of the movie. der Welt” beenden mußten. Das ist die Gegend des Times Square, die 42. Straße New Yorks, wo alles käuflich ist: Rauschgift, Tod und Liebe in sämtlichen Variationen. Reagiert man hier auf entsprechende Angebote nicht, wird man mit einem hochgereckten Zeigefinger in die Flucht geschlagen, dem „go sleaze”. Auf deutsch: mach dich dünn, du kannst mich! In diesem kaputten Winkel der Welt ist das 15-jährige Sumpfpflänzchen Nicky (Robin Johnson) zu Hause. Sie schaut aus wie ein Punker und sie lebt so konsequent wie die wenigsten Punker: Um jeden Preis will sie Musik machen, gegen die Kaputtheit ihrer Umwelt. Ihr einziger Freund scheint ihre Gitarre zu sein, die sie überall mit sich herumschleppt. Ihre Kleider macht sie aus alten Plastiksäcken. Mit ihrer Stimme könnte sie Kartoffeln reiben. Dort, wo es in New York am feinsten zugeht, lebt Pamela	(Trini Alvarado). Sie ist 13. Ihr Vater, ein smarter Politiker, will zu Karrierezwecken den Times Square vom lichtscheuen Gesindel säubern. Für seine Kampagne spannt er auch Pam ein. Sie wehrt sich und wird von ihm zur Beobachtung ihres Geisteszustandes in ein Hospital eingeliefert. Hier trifft sie auf Nicky, die aufgegriffen wurde, als sie wütend ein Auto demolierte. gegenüber Ärzten und Schwestern entsetzt. Doch allmählich beginnt eine Freundschaft zwischen den beiden ungleichen Mädchen. Sie erkennen, daß die Untersuchung nur eine Schikane der Erwachsenen ist, die sie an ihre Welt anpassen wollen — mit Gewalt. In einem Krankenwagen fliehen sie und tauchen in einem leeren Lagerhaus unter. Nachdem sie Blutsbrüderschaft geschworen haben, nennen sie sich ,,Sleaze Sisters” und werfen sich in grellbunte Klamotten. So „getarnt” gehen sie auf Diebestour, schrecken allerdings vor großen Coups zurück und halten dafür Touristen zum Narren. Ihr Vater sucht indessen verzweifelt nach ihr und bedroht den Rock-Moderator Johnny. 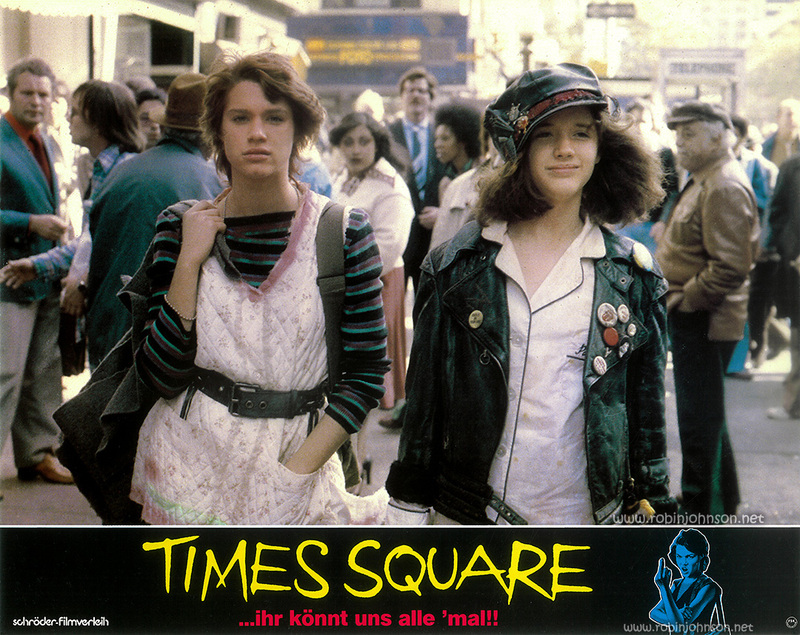 Johnny, der eine Menge Trouble mit seinen Bossen kriegt, auf dem flachen Dach eines Times Square-Kinos aufzutreten, was freilich nicht genehmigt ist, aber die „Sleaze Sisters”-Fans strömen zu Tausenden herbei. Als Nicky stürmisch gefeiert wird, erkennt Pam, daß Nicky es jetzt auch ohne ihre Hilfe zur Rock- Sängerin bringen wird. Pam kehrt zu ihrem Vater zurück, der eines begriffen hat: Er wird jetzt seine Tochter so akzeptieren müssen, wie sie ist. Broadway’s gleaming spotlight has already attracted many who finally put their show in a dark corner of the “dirtiest square mile of the world “. This is the area of Times Square, 42nd Street in New York, where everything is for sale: drugs, death and love in all its variations. If you don’t take the deals, you will be sent packng with a raised index finger, the “go sleaze”. In German: make yourself scarce, bite me! In this broken corner of the world, 15-year-old marsh plant Nicky (Robin Johnson) is at home. 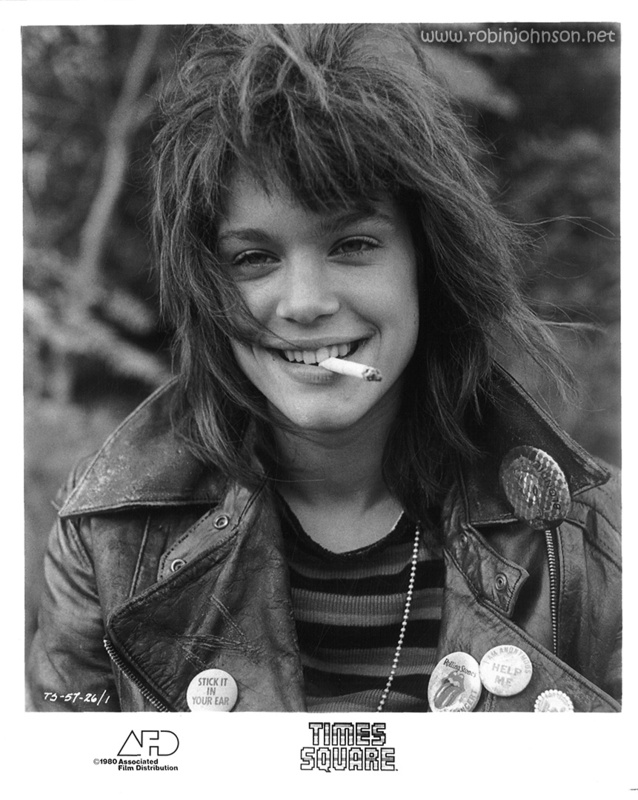 She looks like a punk and she lives rigorously as few punks: She wants to make music at all costs, against the brutality of her environment. Her only friend seems to be her guitar, which she carries around with her everywhere. She makes her clothes out of old plastic bags. She could grate potatoes with her voice. 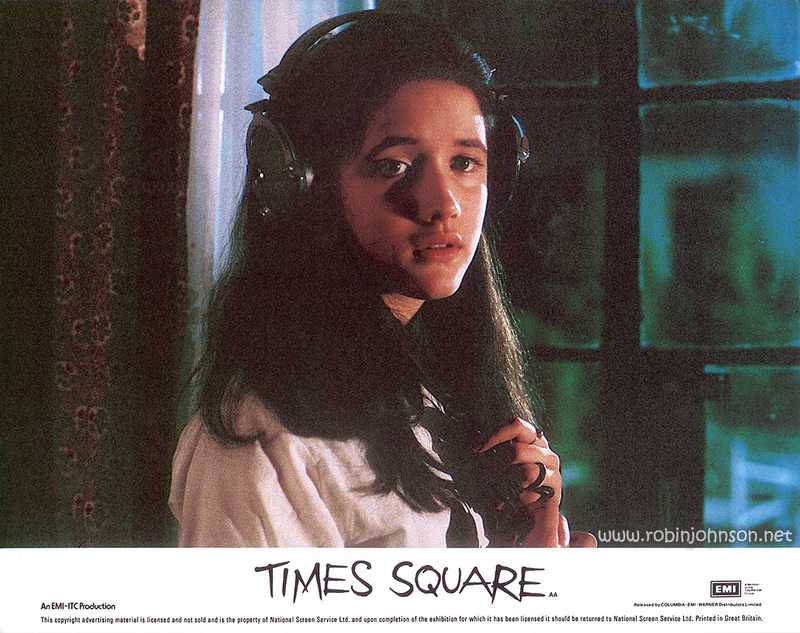 Pamela (Trini Alvarado) lives in the best neighborhood in New York. She is 13. Her father, a smart politician, wants to clean Times Square of its shady characters for career purposes. For his campaign, he also ropes in Pam. She rebels and is taken to a hospital by him to observe her state of mind. Here she meets Nicky, who was picked up when she angrily demolished a car. In the beginning, Pam is appalled by Nicky’s cynical remarks and her intransigent conduct towards the doctors and nurses. But gradually a friendship begins between the two dissimilar girls. They realize that the examination is just harassment by adults who want to conform them to their world – by force. In an ambulance, they flee and hide in an empty warehouse. 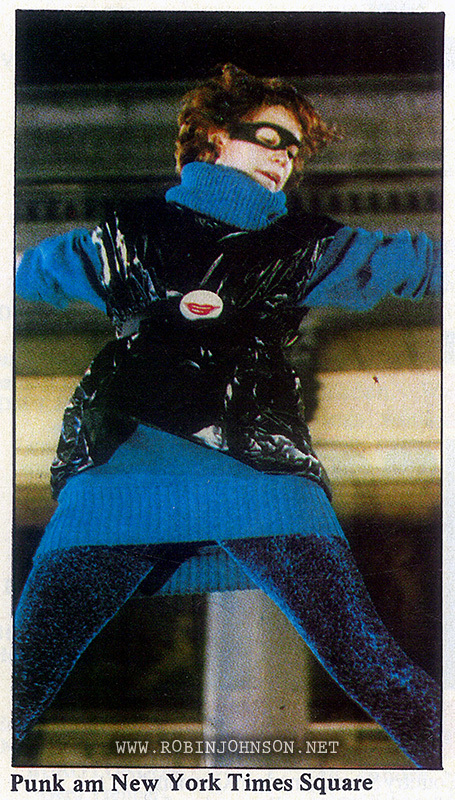 After swearing blood brotherhood, they call themselves “Sleaze Sisters” and throw themselves into garish clothes. So “camouflaged” they go on a thieving spree, but shrink back from big crimes, and make fools of tourists. By now, reports have been published in all the newspapers about the teen dropouts. 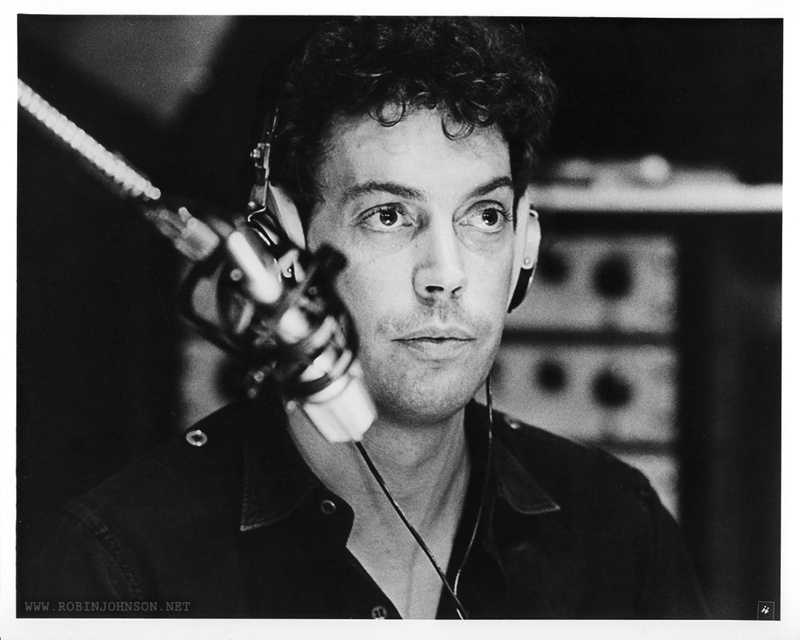 Disc jockey Johnny La Gardia (Tim Curry) believes he received an anonymous letter from Pam shortly before, describing her problems and loneliness. 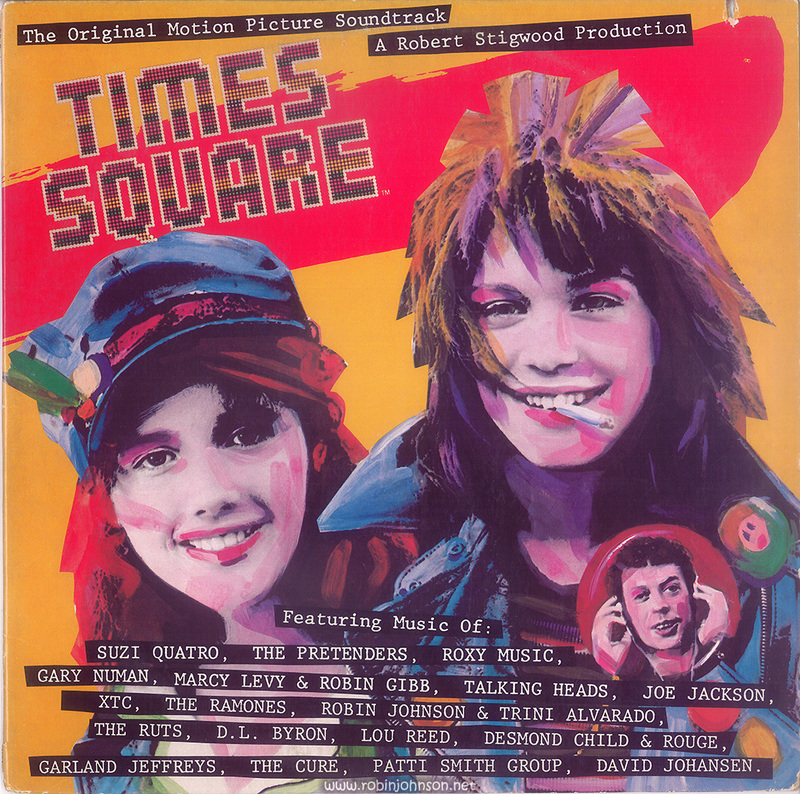 From the radio station he asks them not to give up and to go their own way, Nicky finds a job in a band in Times Square, Pam becomes a go-go girl. Meanwhile, her father desperately searches for her and threatens the disc jockey Johnny. 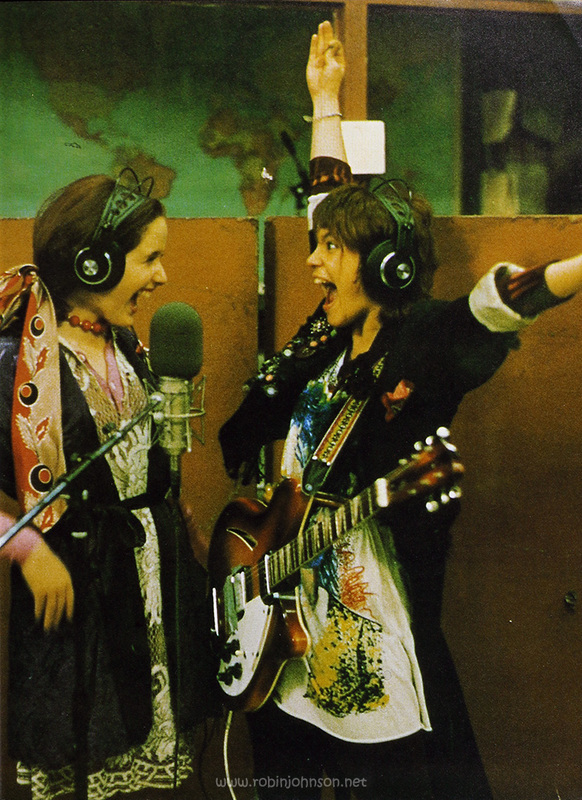 Through performances in the station, the “Sleaze Sisters” become teenage idols. 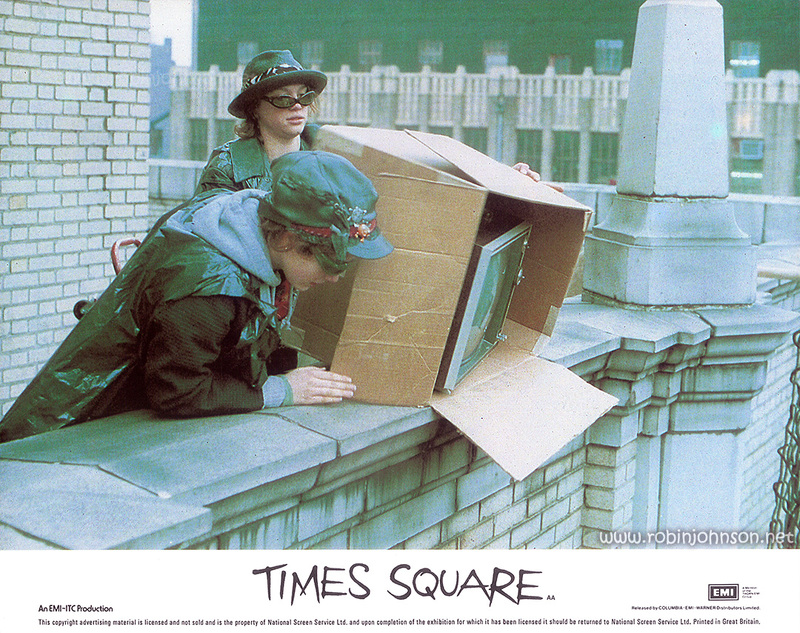 Their graffiti can be found on every wall, they carry their belongings around like tramps in plastic bags, and their special gimmick is throwing TV sets off skyscrapers until tossing the boring screens becomes the new youth sport. 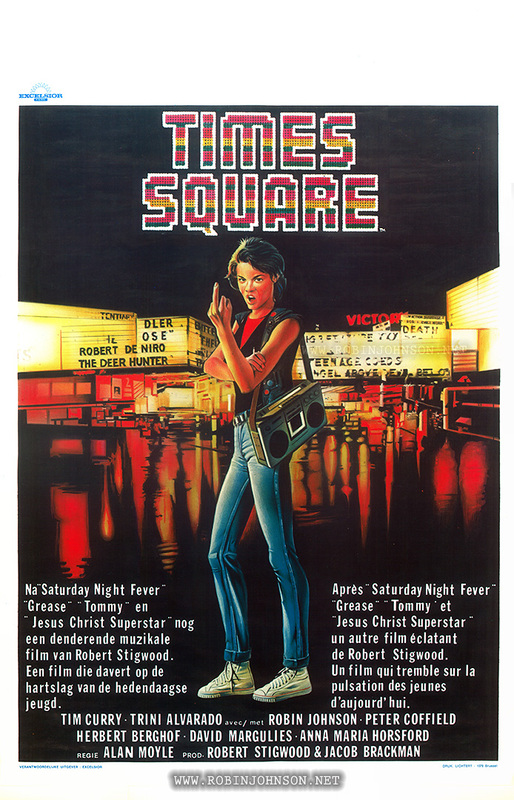 Finally, thanks to Johnny, who gets in a lot of trouble with his bosses, Nicky manages to perform on the flat roof of a Times Square cinema, which is not authorized, but the “Sleaze Sisters” fans flock by the thousands. 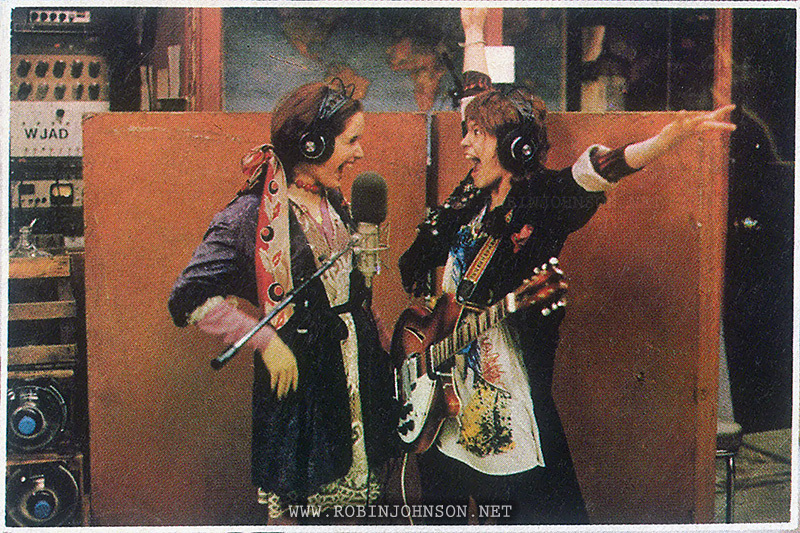 When Nicky is wildly celebrated, Pam realizes that Nicky will become a rock singer without her help. Pam returns to her father, who realizes one thing: he will now have to accept his daughter as she is. And finally, on page 110, we get one final advertisement. PLEASE CHECK YOUR LOCAL DAILY NEWSPAPERS. 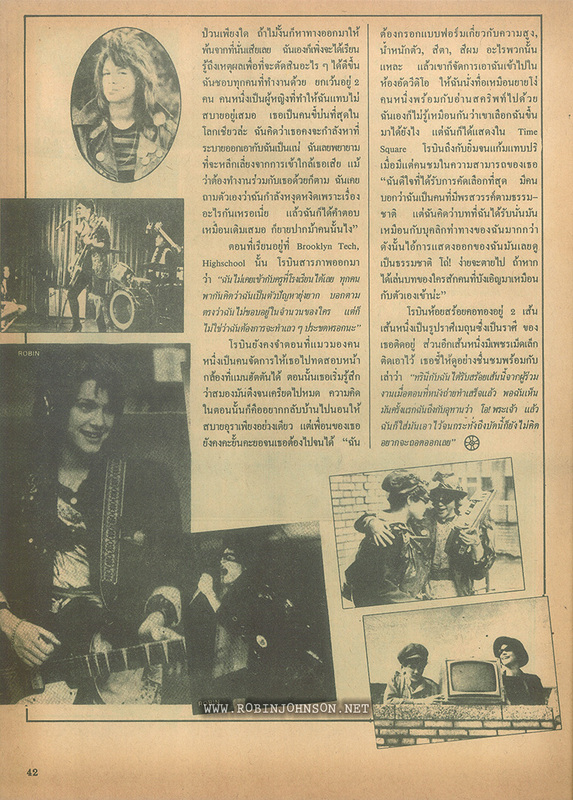 The photos on pages 66-67 are four of the six published a month before in Bravo No. 21. 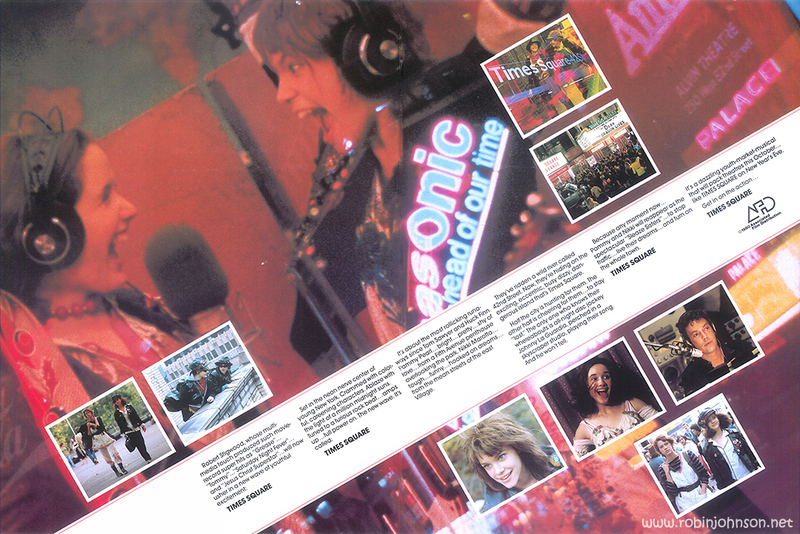 The shot used on page six is a crop of the center bottom photo in the collage in the center of the UK Pressbook. 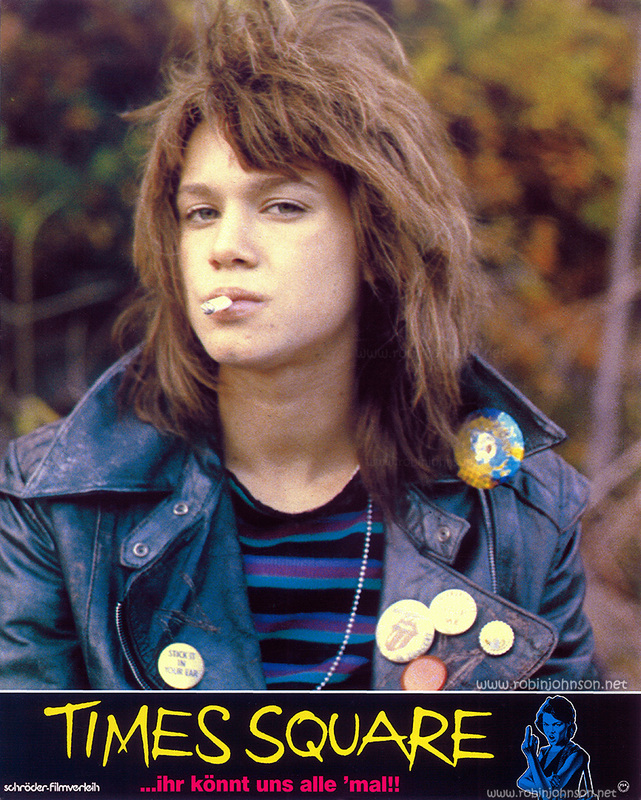 Posted on 4th February 2019 in "Times Square"
The Australian movie poster featured the glorious Mick Rock photo of Robin that graced the earliest piece of Times Square advertising, which is possibly my favorite image used to promote the movie. Once I’d found this I was looking forward to having it framed, but unfortunately not only are the Australian posters printed on a non-glossy lighter paper stock than the rest of the world’s posters, this one’s color registration is way off. It doesn’t show so much in this reduced-size image, but on the full-size poster everything has a prominent green outline. Sorry, Robert Burton Printers, someone was half-assing the job one fateful day in 1981. I guess I’ll have to dig out my copy of the Australian daybill and have that framed. It’s much smaller, but I’m pretty sure the colors are properly aligned. 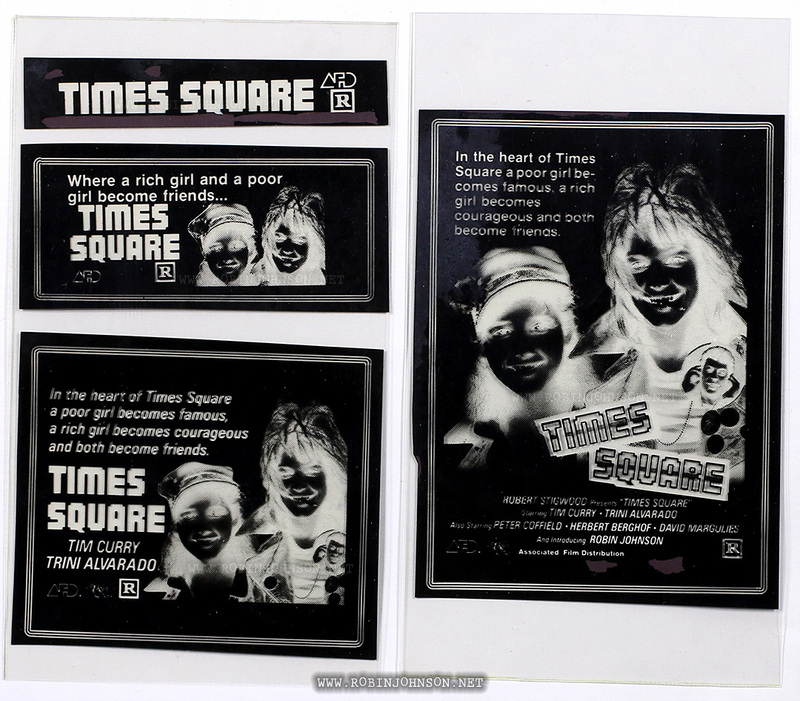 Posted on 22nd January 2019 in "Times Square"
Exactly what it says on the label – four pieces of black-and-white film apparently used to print newspaper ads with, dating from October 1980 or shortly before. 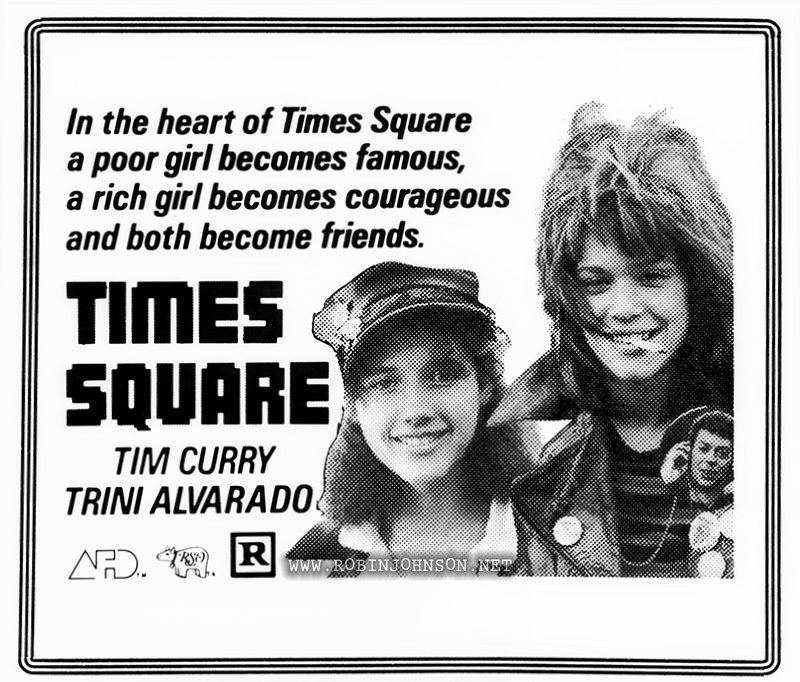 The first is just the film’s title; the second adds Trini and Robin’s faces from the poster, side-by-side; the third uses the image from the poster including Tim Curry on Nicky’s badge; and the fourth reproduces almost the entire poster. 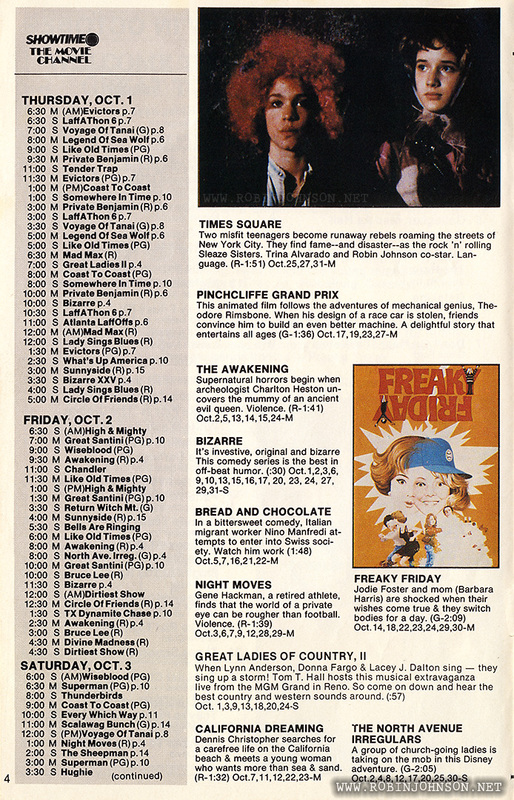 You can tell they’re American ads, produced fairly early on, since on the second-largest, Tim Curry is given top billing (as he has in the movie) and Robin, although pictured, isn’t mentioned. 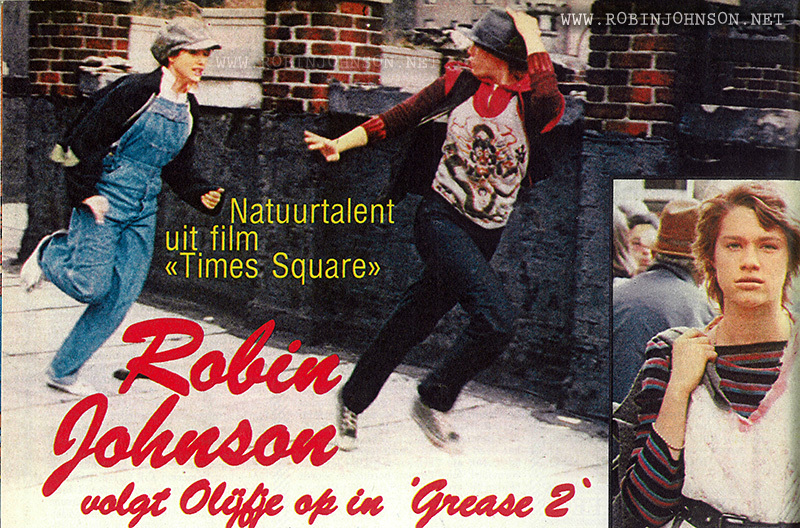 As we’ve seen, by the time the film had passed through Europe towards the Pacific, Robin had become the first name associated with it. 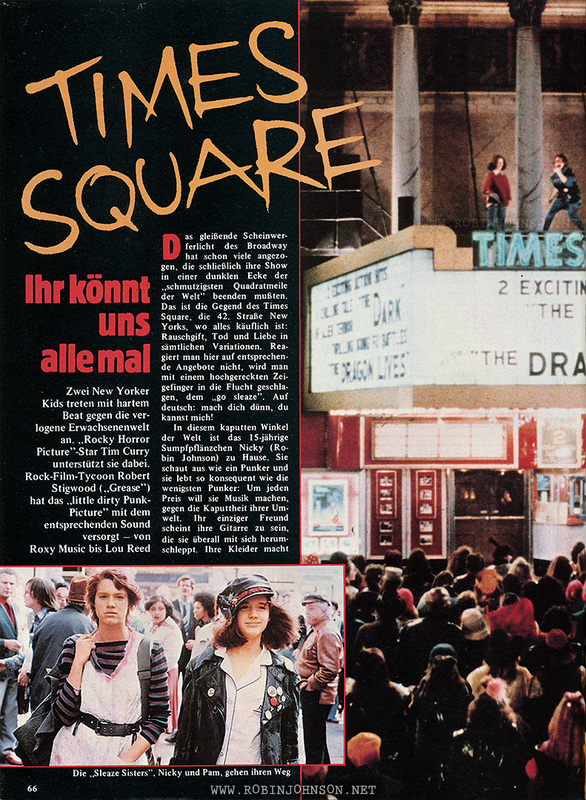 Posted on 9th January 2019 in "Times Square"
May 1982, and Times Square was about to have its final premiere, in West Germany. Why did it take this long, over a year and a half after its initial premiere, and a year after the rest of Europe had seen it? I have no idea. 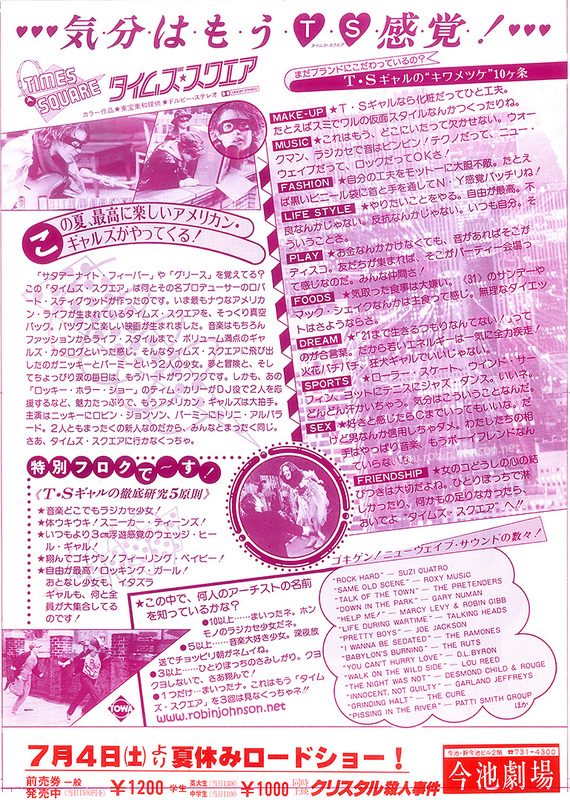 But someone still had hope for the movie, as shown by the two-page spread in Bravo, featuring the same sort of excited plot synopsis published in Filmstar No. 3, Sonido No. 56 and Film Review Vol. 31 No. 2. 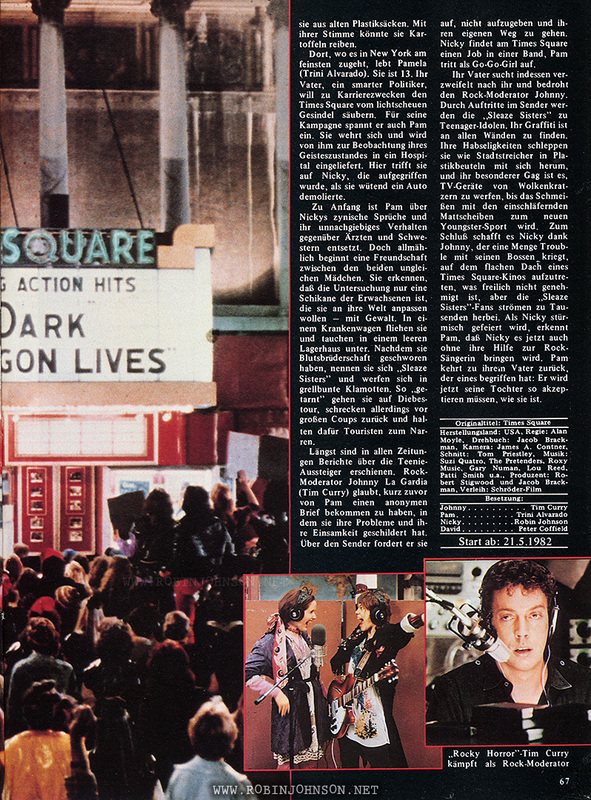 The big picture across the two pages was last seen in the February 1981 Movie 81 and on the Japanese movie poster. The picture on the top left of page 34 was the top middle image on the Mexican movie poster. The center photo on page 34, of Mr. Pearl attacking Johnny, is I think making its first appearance here. We last saw the bottom photo in the Japanese souvenir program book and flyer, and on a British lobby card. 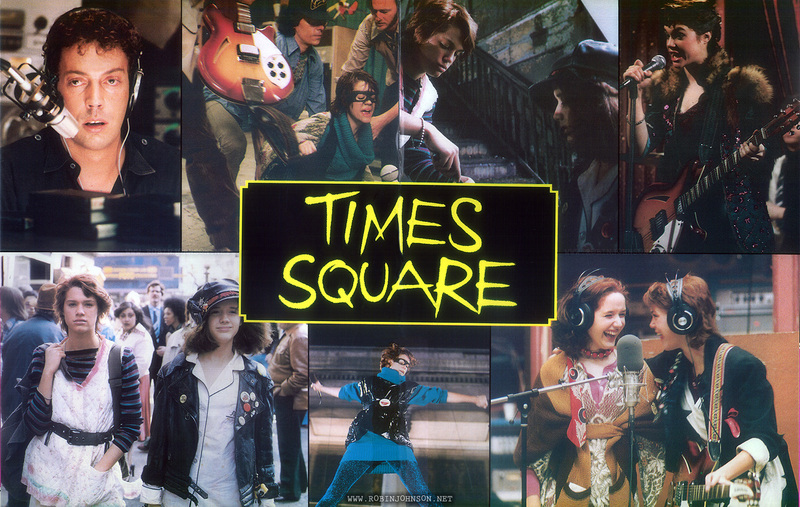 On page 35, the shot of Johnny at the mic was also a British lobby card, and appeared in Movie 81. 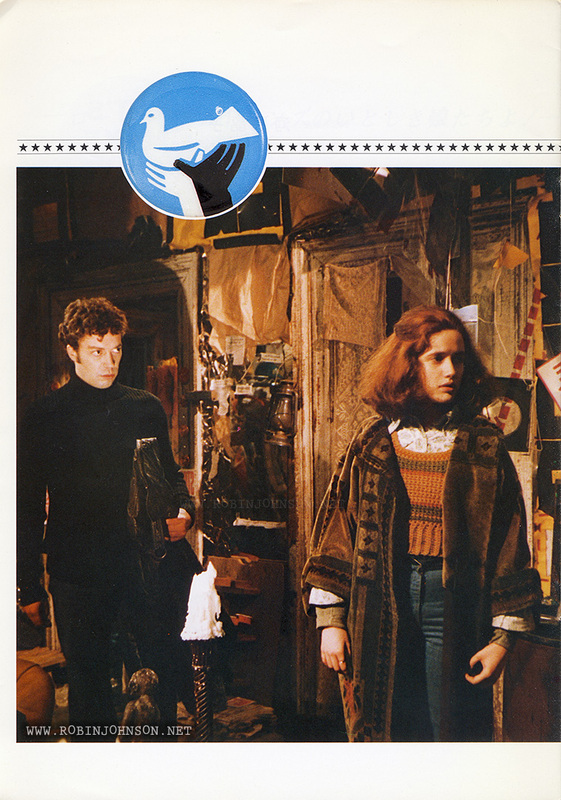 And the bottom photo was also a British lobby card, last seen in Joepie No. 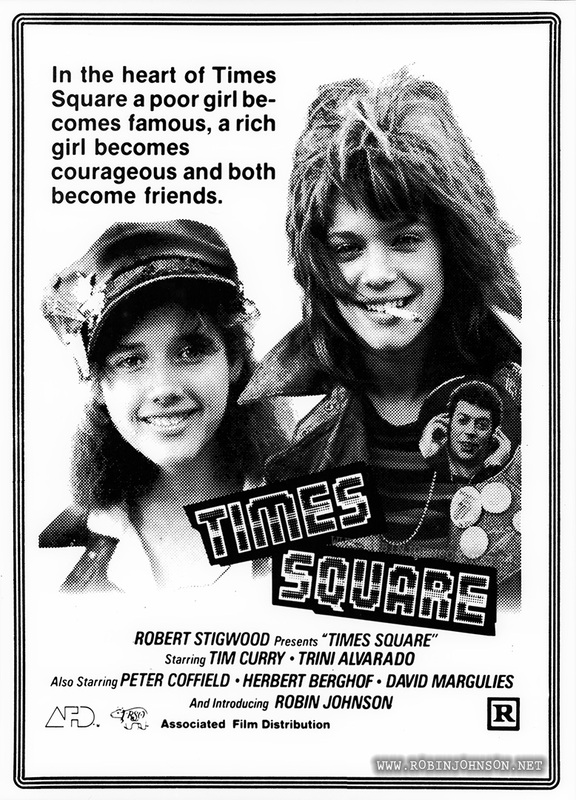 365 in March 1981, and first seen in the “Robert Stigwood Presents Times Square” folder from sometime in 1980 well before the movie’s release. Here’s the text by Peter Rauscher in German, followed by my attempt at a translation. 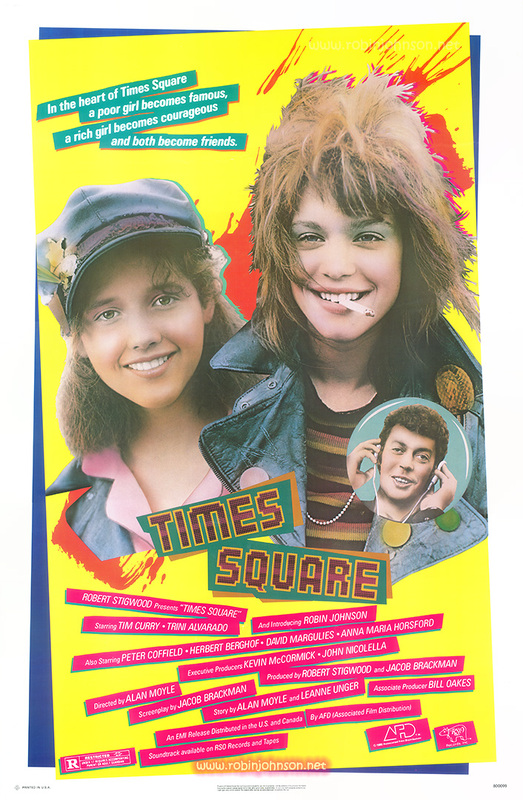 Die 16jährige Nicky Marotta (Robin Johnson) und die 13jährige Pamela Pearl (Trini Alvarado) liegen zusammen im Zimmer eines New Yorker Krankenhauses. Beide sollen auf ihren Geisteszustand untersucht werden. Nicky, weil sie eine notorische Streunerin ist; Pamela, weil ihr Vater, ein ehrgeiziger Politiker, mit ihr nicht mehr klarkommt. Eines Tages überredet Nicky Pamela zur Flucht. Im Nachthemd entwischen sie aus dem Krankenhaus, schnappen sich einen Krankenwagen und brausen los. In einem alten Schuppen am Times Square, einem der berühmtesten und berüchtigtsten Plätze New Yorks, finden sie Unterschlupf. 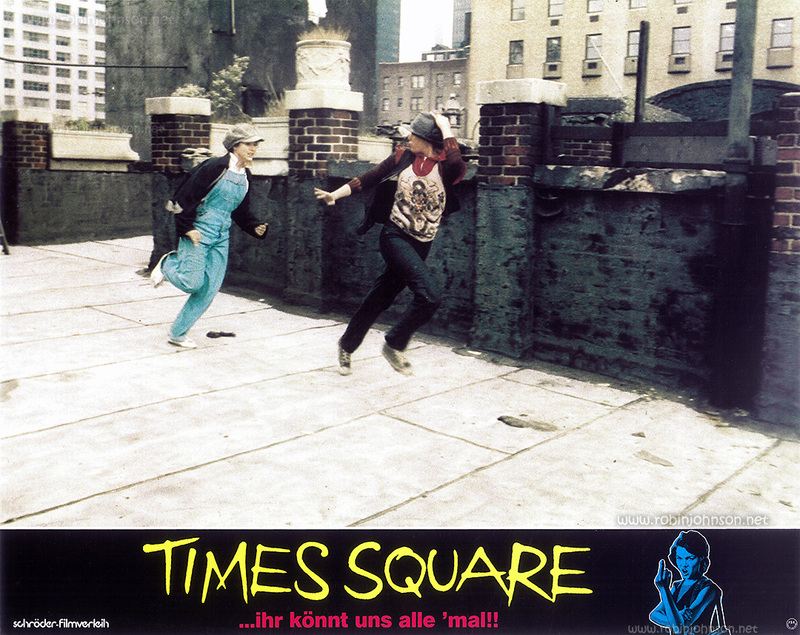 So beginnt der Film „Times Square“ (in Deutschland hat er noch den Untertitel „Ihr könnt uns alle mal“). Die beiden Mädchen finden ihr „freies“ Leben herrlich. Sie tragen die ausgefallensten Klamotten, hören pausenlos heiße Musik und jobben abends in einer Kneipe. 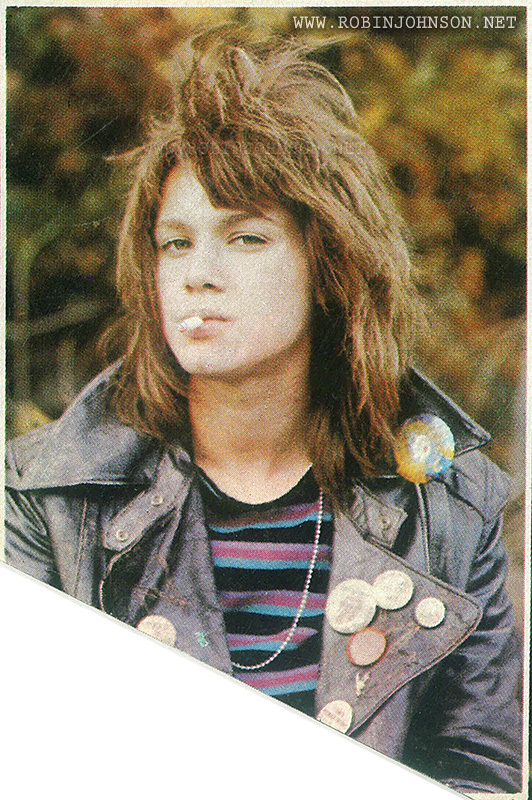 Nicky, die gut Gitarre spielt, singt mit einer Band,| Pamela arbeitet als Go-go-Girl. Natürlich hat Pamelas Vater alle Hebel in Bewegung gesetzt, um seine Tochter zu finden. 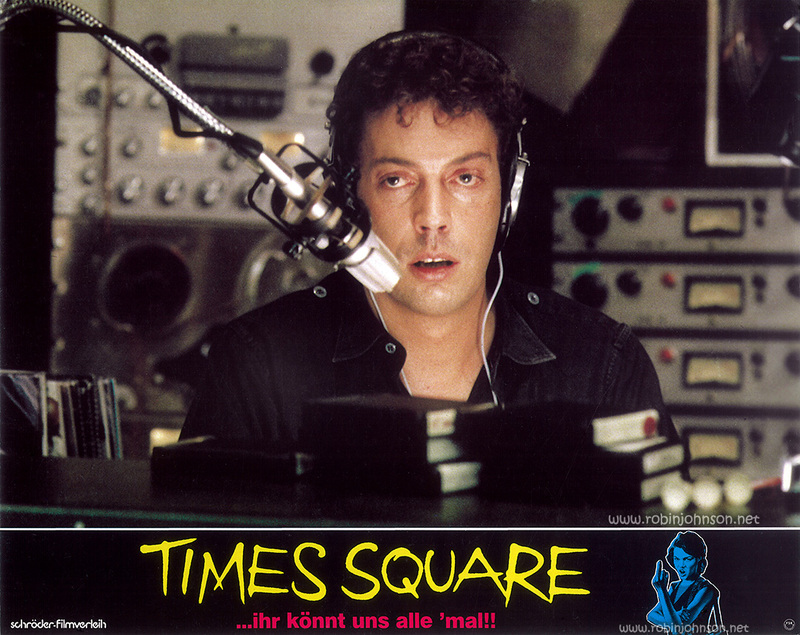 In den Fall hat sich auch der beliebte Discjockey Johnny LaGuardian (Tim Curry, der Dr. Frank N. Furter aus der „Rocky Horror Picture Show“) eingeschaltet. Er ist so eine Art Thomas Gottschalk. Ihm vertrauen die Teens, wenn er täglich am Mikrofon zu ihnen spricht. Johnny findet die beiden und verspricht, ihnen zu helfen. So dürfen die Mädchen ein von Nicky komponiertes Lied über den Sender singen. Die jugendlichen Hörer sind begeistert. Johnny erzählt ihnen die Geschichte der beiden Ausreißerinnen. Nicky und Pamela werden auf ihre Art zu „Heldinnen“. 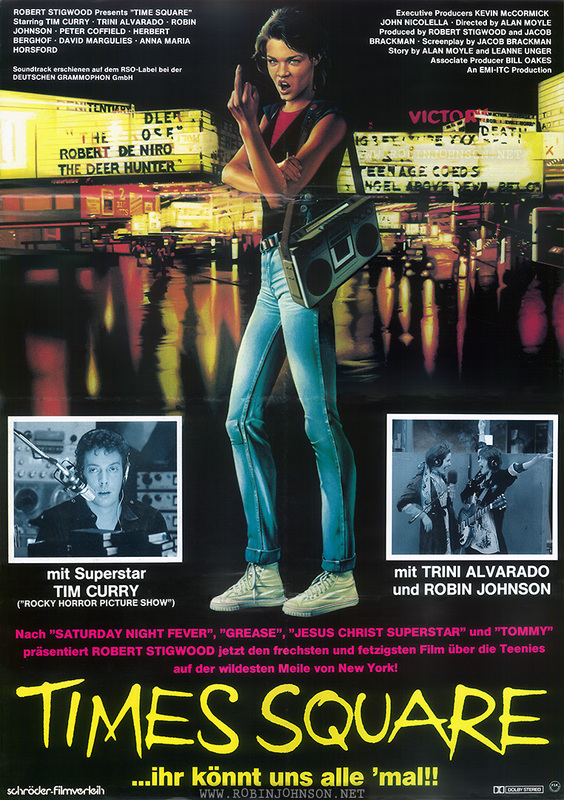 Einer der Höhepunkte des Films ist die Aufforderung von Nicky und Pamela, dem Götzen „Fernsehen“ abzuschwören. Und Hunderte machen mit: Zum Entsetzen der Eltern werfen die Teenager die Fernseh-Apparate einfach auf die Straße. Doch die beiden Mädchen sehen bald ein, daß ihr Leben so nicht mehr weiterlaufen kann. 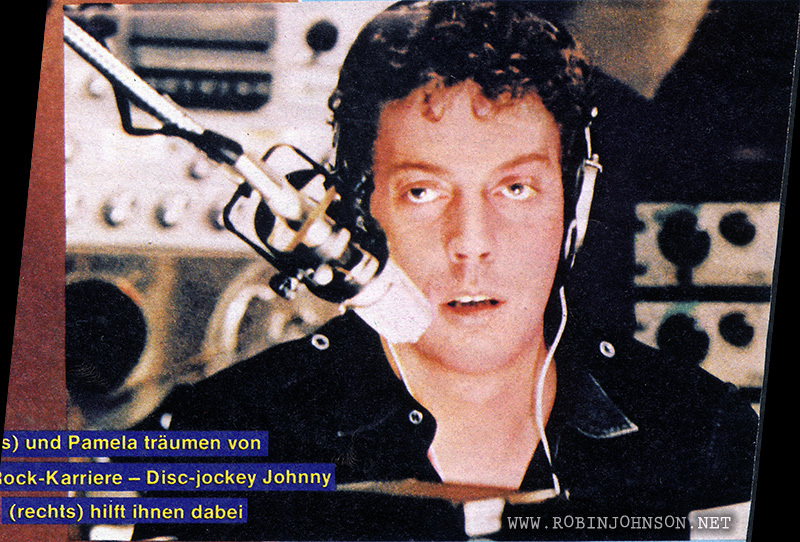 Und wieder erweist sich der Discjockey Johnny als Retter. 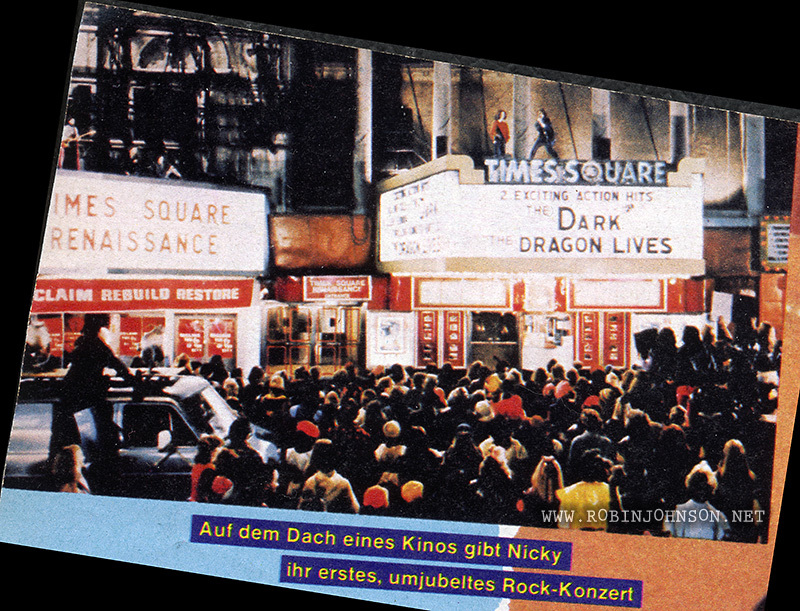 Er organisiert für Nicky ein Konzert auf dem Dach eines Kinos. Aus allen Richtungen New Yorks strömen die Kids in gleicher Aufmachung wie Nicky und Pamela zum Times Square. Das Konzert, obwohl von der Polizei nicht genehmigt, wird ein Riesenerfolg. Nicky ist ihrem Traum, ein Rock- Star zu werden, nähergekommen. Pamela kehrt zu ihrem Vater, der eingesehen hat, daß auch er viele Fehler gemacht hat, zurück. Die beiden Hauptdarstellerinnen sind Neulinge. 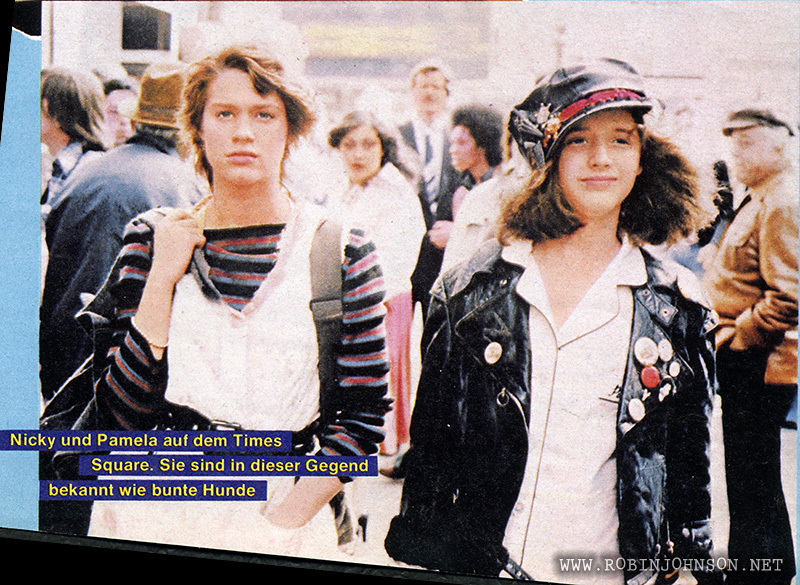 Nicky (Robin Johnson) wurde von der Schule weg engagiert, Pamela (Trini Alvarado) drehte bereits einen Film. Toll natürlich Tim Curry. 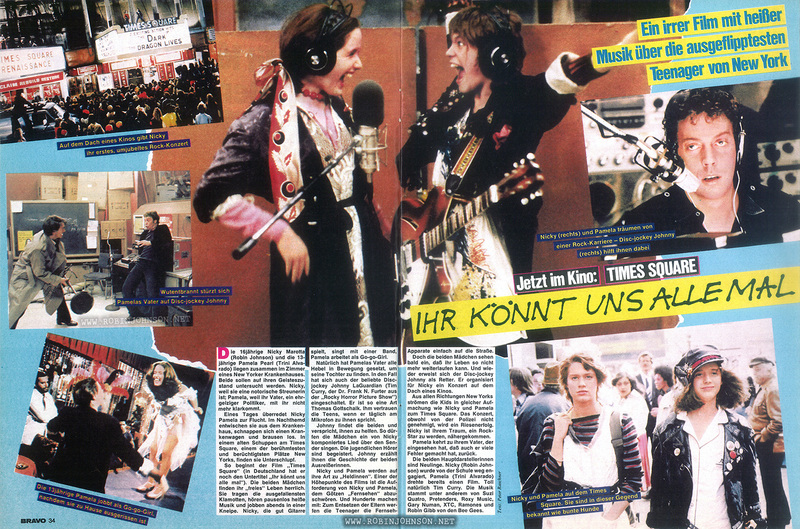 Die Musik stammt unter anderem von Suzi Quatro, Pretenders, Roxy Music, Gary Numan, XTC, Ramones und Robin Gibb von den Bee Gees. 16-year-old Nicky Marotta (Robin Johnson) and 13-year-old Pamela Pearl (Trini Alvarado) lie together in the room of a New York hospital. Both to have their mental health examined. Nicky because she is a notorious stray; Pamela because her father, an ambitious politician, can’t handle her any more. One day Nicky persuades Pamela to escape. In their nightgowns they escape from the hospital, steal themselves an ambulance and zoom off. In an old shack in Times Square, one of the most famous and most notorious places in New York, they find shelter. 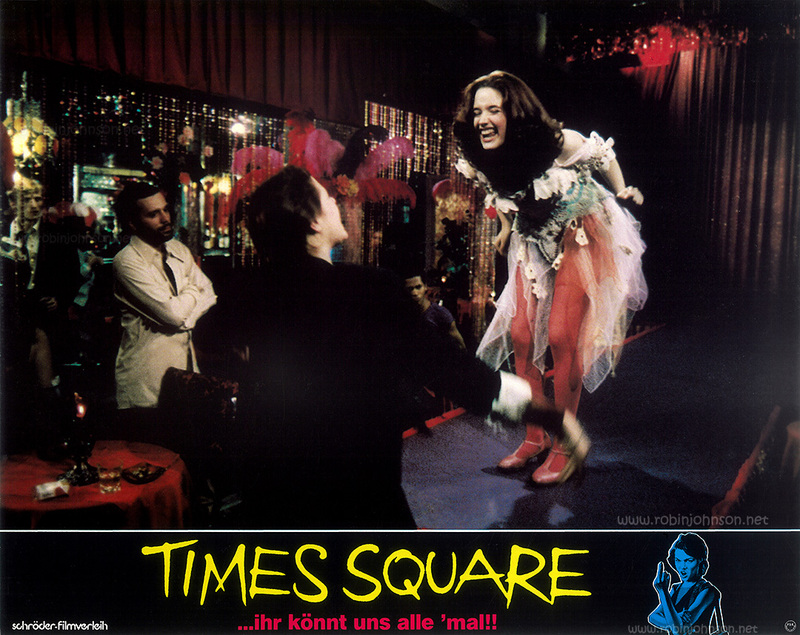 So begins the film “Times Square” (in Germany it also has the subtitle “You can all […] our […]”). Both girls find their “free” life wonderful. They wear outrageous clothes, listen to hot music nonstop and in the evening work in a bar. 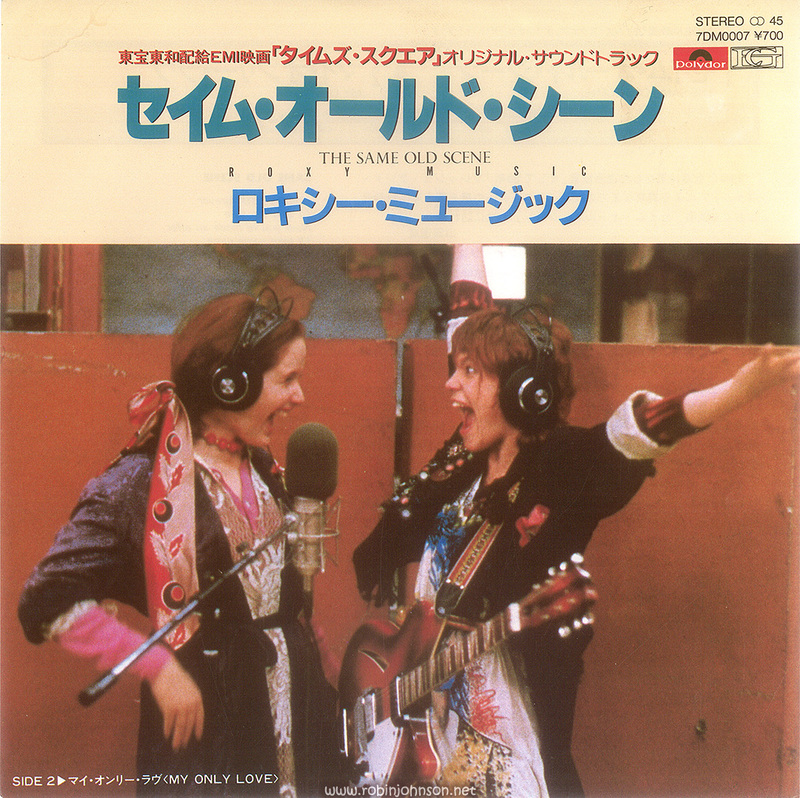 Nicky, who plays guitar well, sings with a band; Pamela works as a go-go girl. Naturally Pamela’s father has pulled out all the stops to find his daughter. 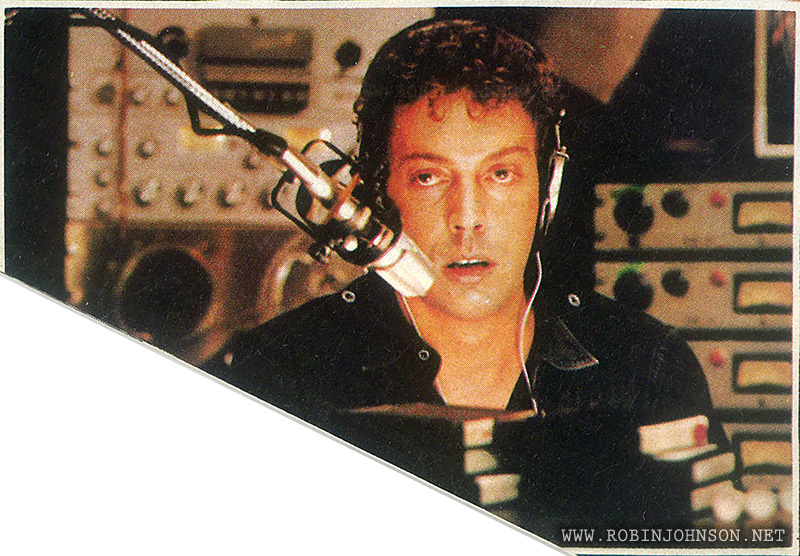 On this case the popular disc jockey Johnny LaGuardian (Tim Curry, Dr. Frank N. Furter from “The Rocky Horror Picture Show”) is also involved. He is a Thomas Gottschalk type. The teens trust him when he speaks daily through the microphone to them. Johnny finds them both and promises to help them. 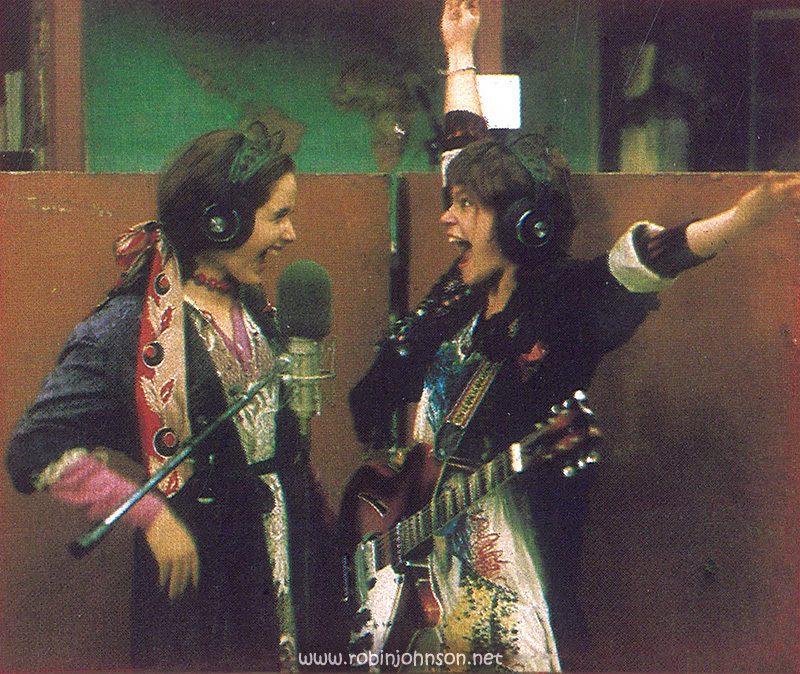 So the girls sing a song composed by Nicky over the radio. The young listeners are inspired. Johnny tells them the story of the runaways. 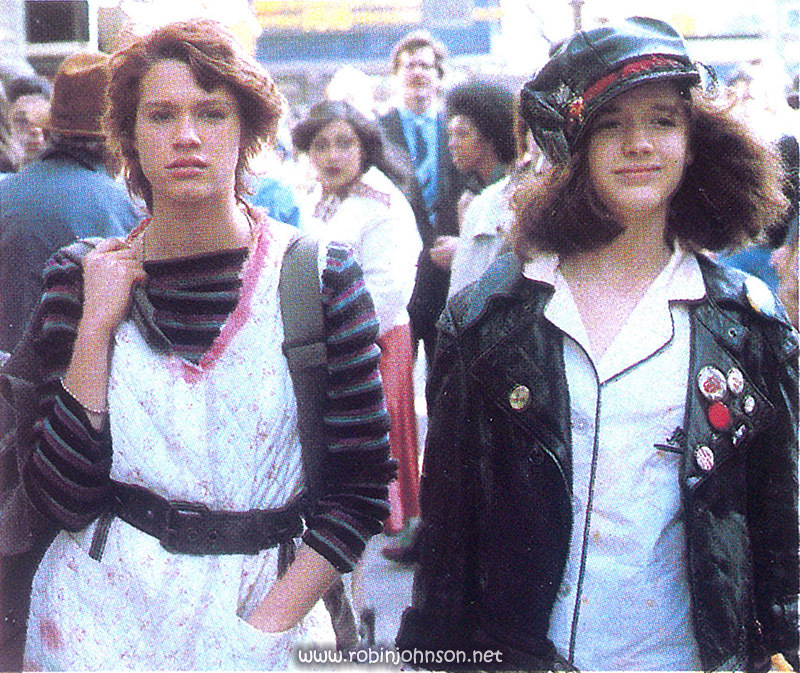 Nicky and Pamela become in their own way “heroines.” One of the highlights of the film is the call of Nicky and Pamela to renounce the idol “television.” And hundreds join in: to the horror of their parents the teenagers simply throw their television sets to the street. But both girls soon see that their life cannot continue this way. And again Johnny the disc jockey comes to the rescue. 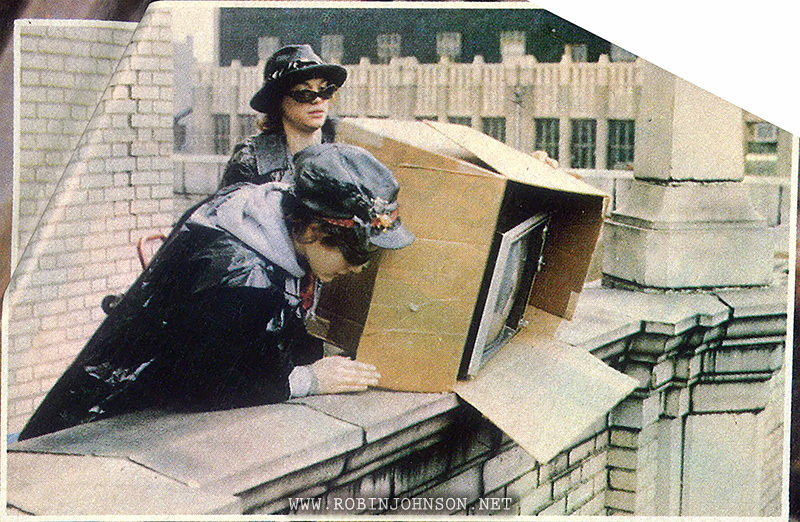 He organizes a concert on the roof of a cinema for Nicky. 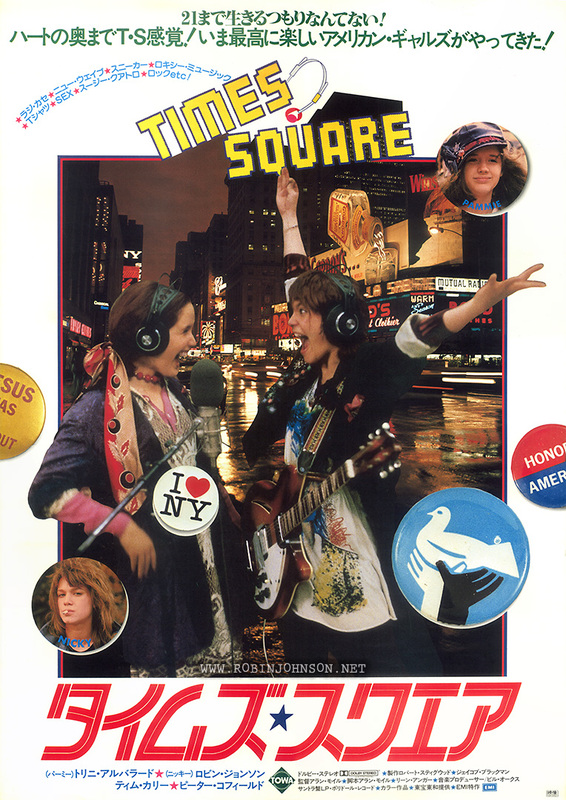 The Kids stream from all areas of New York to Times Square in outfits identical to Nicky and Pamela. The concert, although not authorized by the police, becomes a huge success. Nicky has come closer to her dream to become a rock star. Pamela returns to her father who has realized that he also has made many mistakes. Both leading actresses are newcomers. 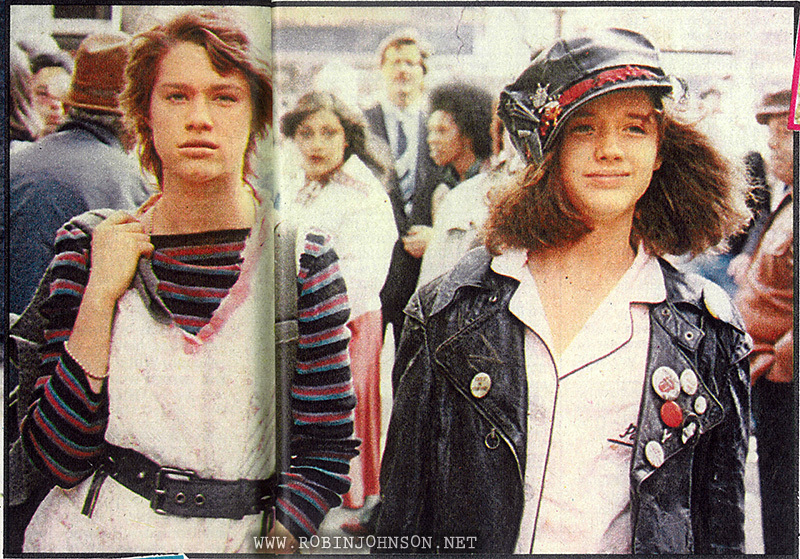 Nicky (Robin Johnson) was hired away from her school, Pamela (Trini Alvarado) previously made a film. 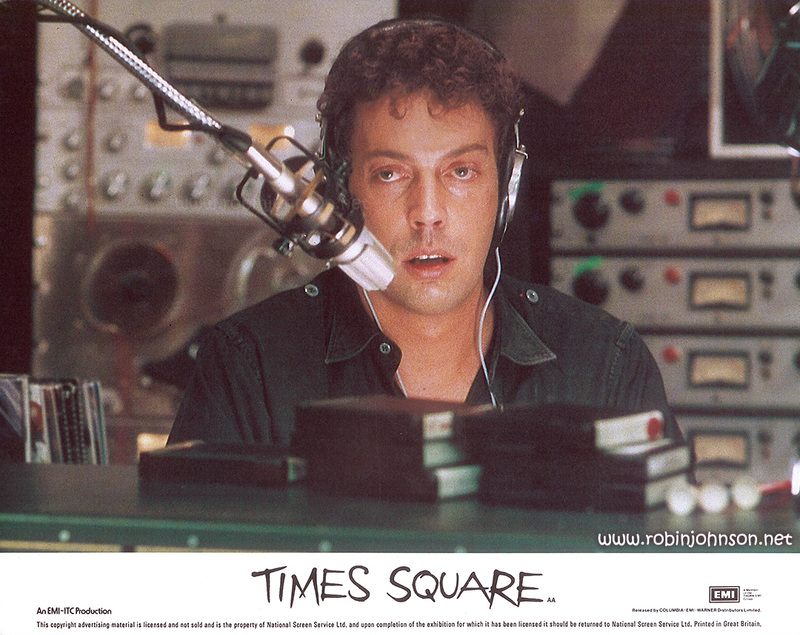 Of course Tim Curry is terrific. 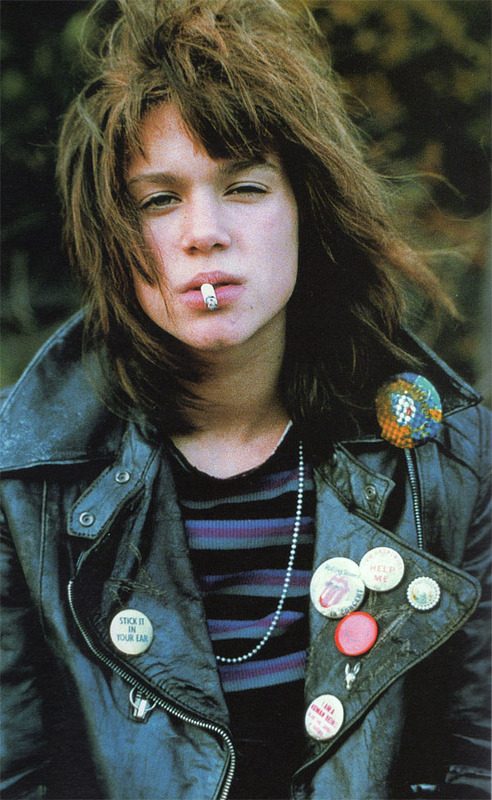 The music is by, among others, Suzi Quatro, Pretenders, Roxy Music, Gary Numan, XTC, Ramones and Robin Gibb of the Bee Gees. I think that last caption might be better translated as “they are well known to the locals,” but I had a hard enough time rendering the German subtitle into colloquial and printable English. 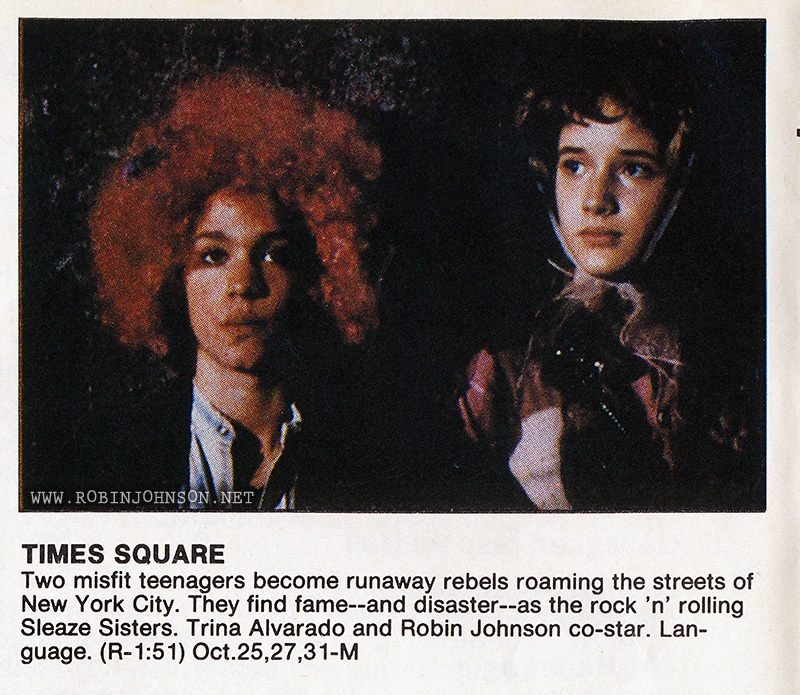 October 1981: Times Square… Great TV Entertainment…? 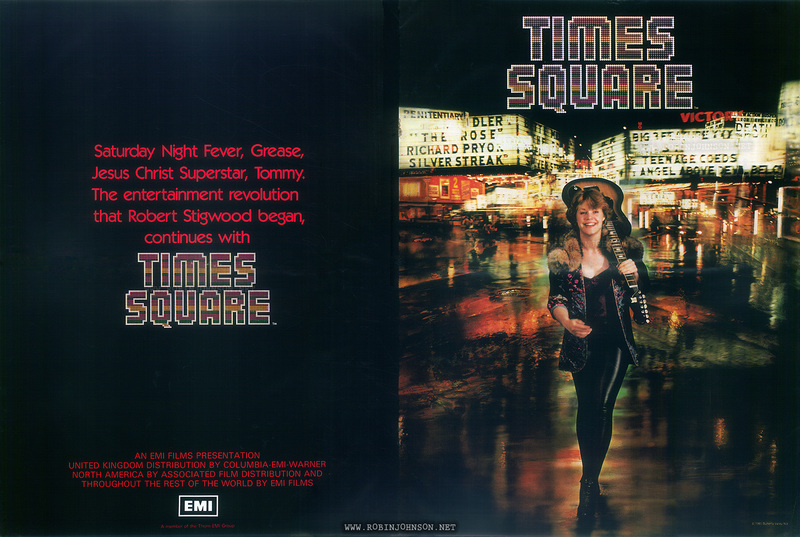 Posted on 27th December 2018 in "Times Square"
According to the October 1981 issue of Great TV Entertainment, the official schedule for Showtime and The Movie Channel, Times Square was shown six times on The Movie Channel, on October 25, 27, and 31. I could have sworn it was shown many times more than that; the showings must have continued into November, or perhaps it was also shown on HBO like everybody, including me, remembers. The photo, typically, isn’t a frame from the movie. 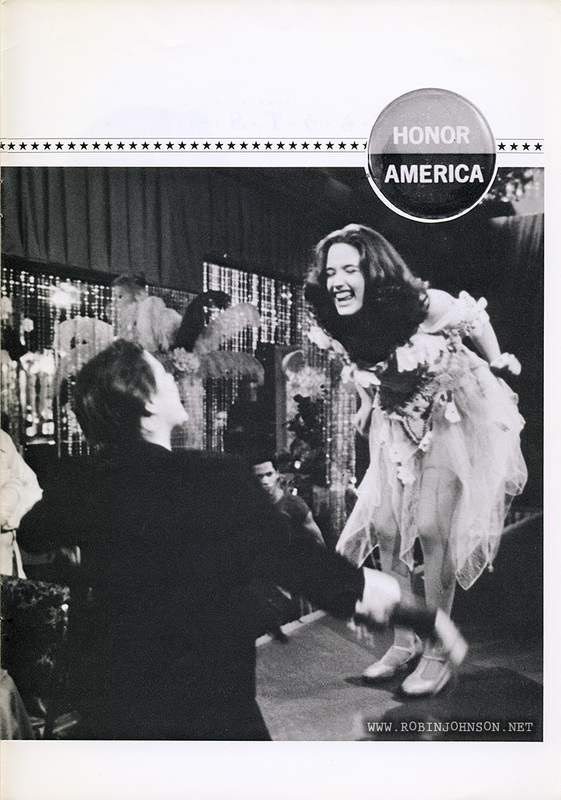 It’s a publicity still shot on set that is making its first appearance in this magazine. The AFD/EMI/RSO promotion people had been sitting on this gem for a year. No wonder the movie flopped. 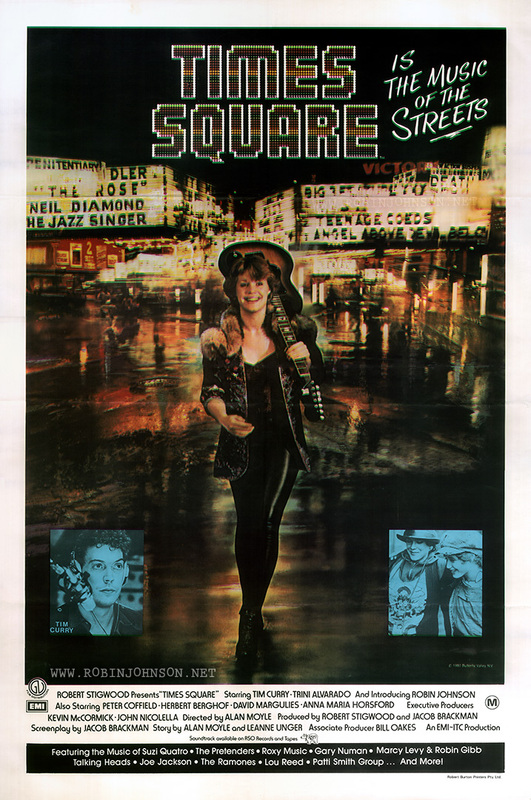 Posted on 15th December 2018 in "Times Square"
ROBIN JOHNSON is an uninhibited product of the streets who sets New York City on edge as a wild runaway from authority in “Times Square.” See it in October on THE MOVIE CHANNEL. 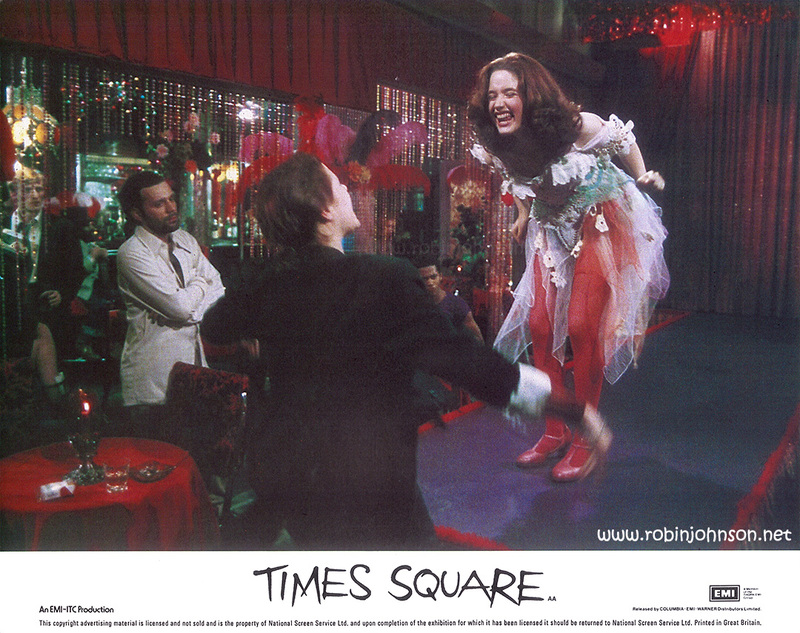 A year after its brief run in theaters, Times Square made it to HBO, and I watched it every single time it ran. This was before my family had a VCR, but my dad had access to a Sony Porta-Pak open-reel video recorder, and I recorded the movie across four reels, during four broadcasts, in glorious black-and-white, and watched it many times over the next few years, until I went off to college and the Porta-Pak went back to wherever it came from. I do still have the reels, but nothing to play them them on, assuming there’s still a signal on them. 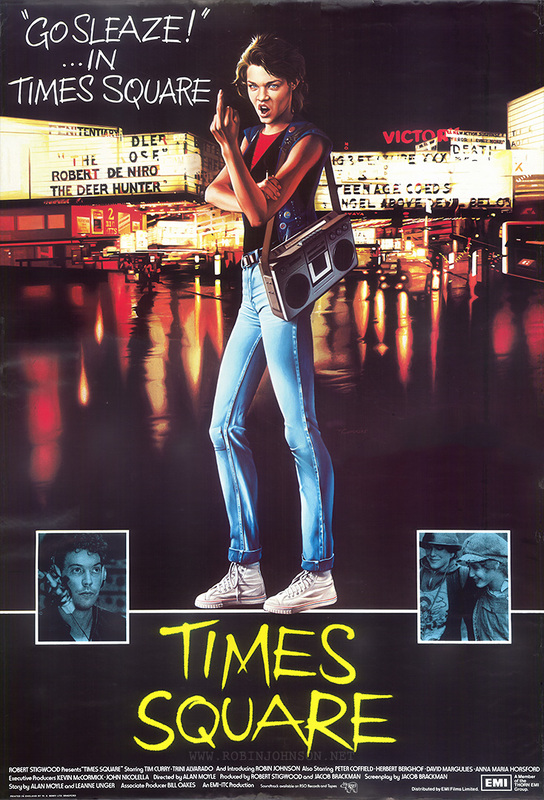 There’s a slim possibility that the American trailer is also on one of those reels: it was used to promote the movie on HBO, and I remember poring over the movie every time I saw it wondering how I kept missing the scene where Nicky and Pammy were splashing each other in the river. 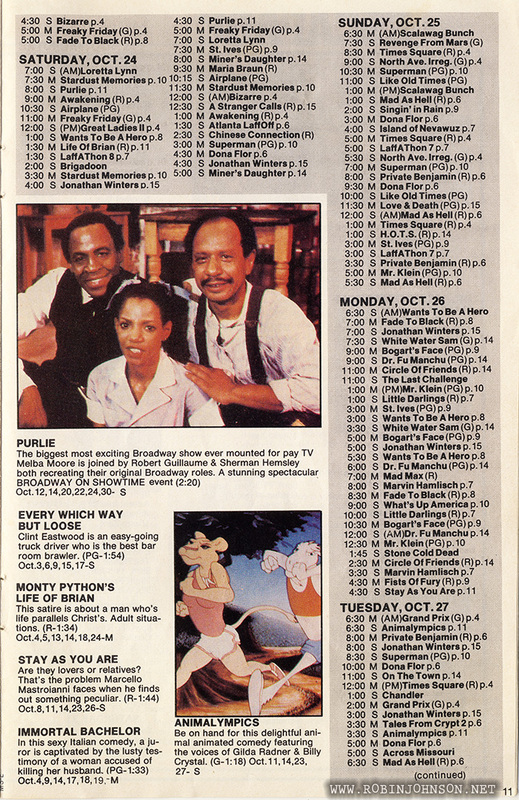 The only thing inaccurate about the above is, although I and everybody else I’ve spoken to who also watched those cable screenings remember vividly that it was on HBO, the only evidence I’ve ever found indicates that it was actually The Movie Channel. And so far, I’m also the only one willing to admit that my memory may be faulty on that one detail. Times Square fans can be obstinate. This photo is TS-57-26/1 from the US Press Material folder, with The Movie Channel’s logo replacing AFD’s on the now slightly expanded white border. The caption is edited from the one supplied with that photo, over a year before. 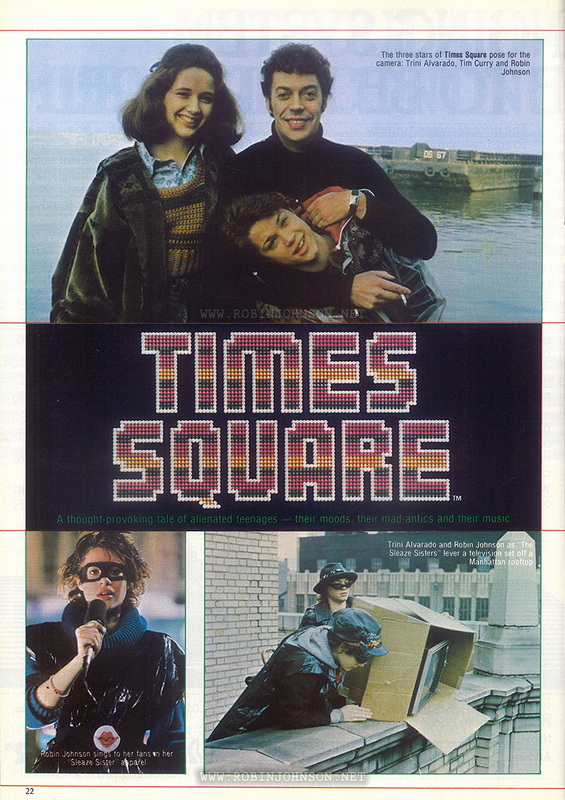 After all the variants and previously unseen promotional photos that came out as Times Square was released around the world, its television debut was promoted with one of the first shots ever released.